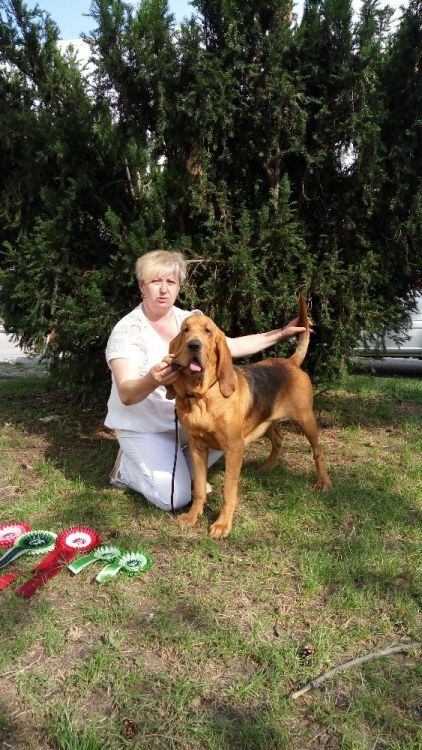 Barnabáš ze Srdce Brd went with us as a moral support for Carla. 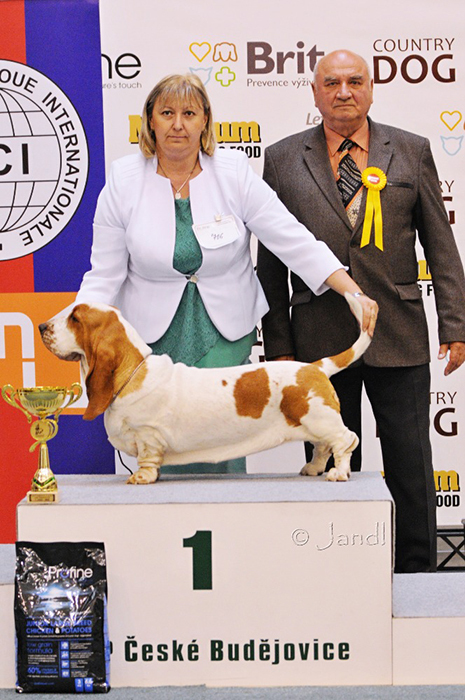 Pipi became Czech Grand Champion and Champion ČMKU. 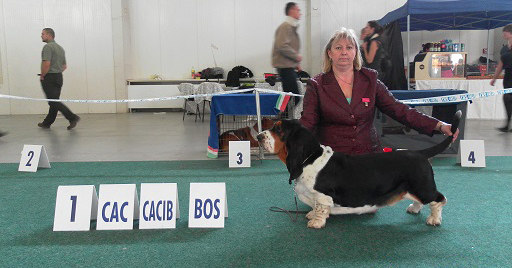 Barnabáš became Czech Grand Champion and Champion ČMKU. 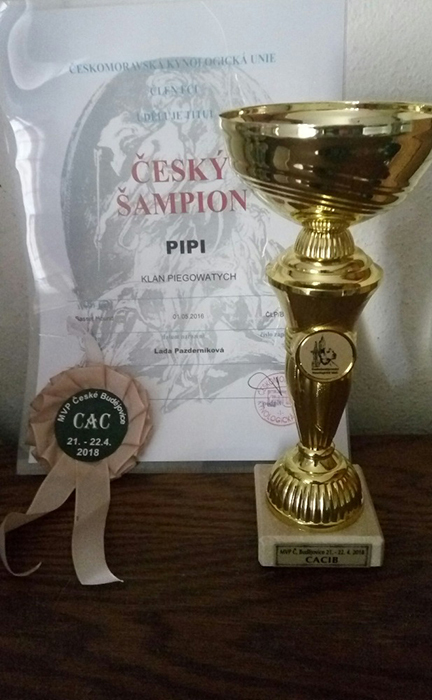 Pipi Klan Piegowatych became Czech Champion. 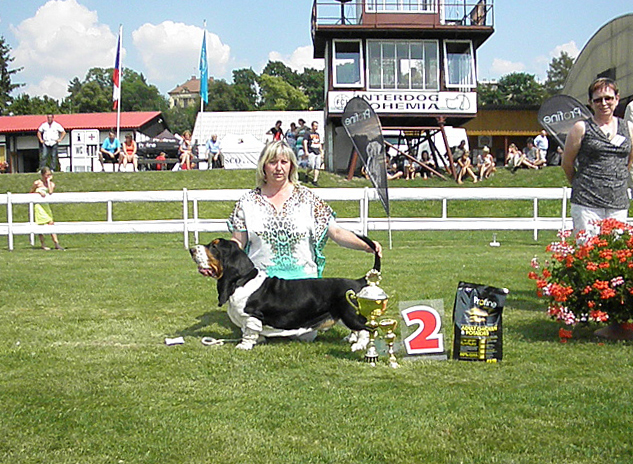 Pipi Klan Piegowatych became Slovak Champion. 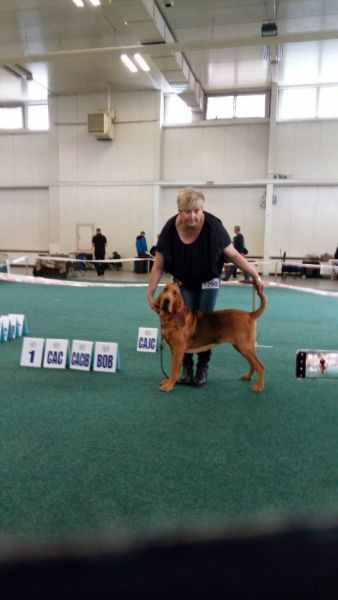 Arthas ze Srdce Brd made it to TOP 10 in his class. 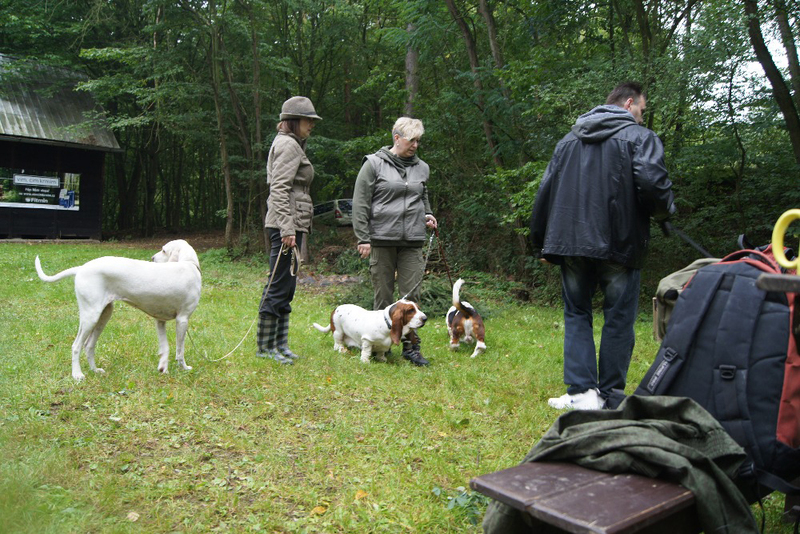 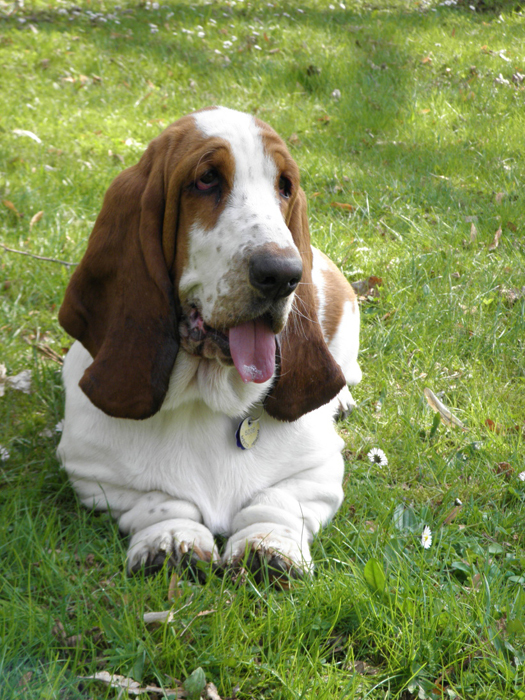 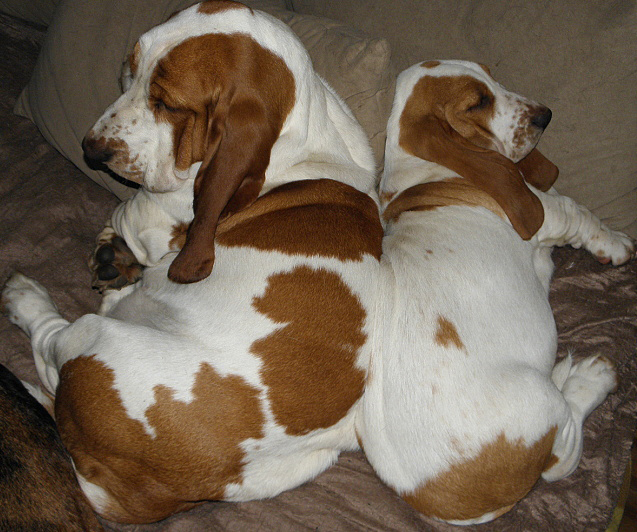 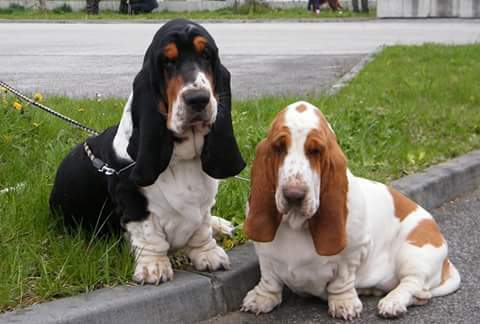 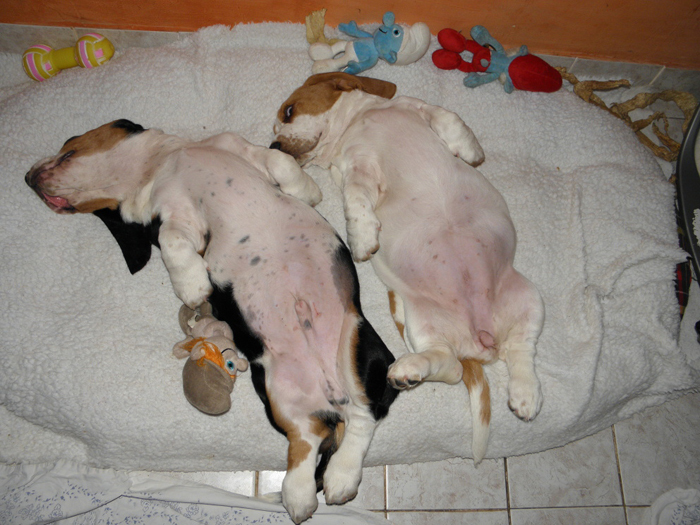 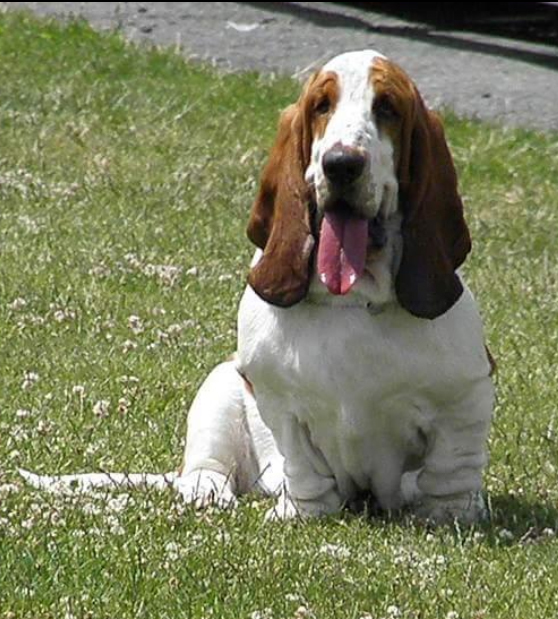 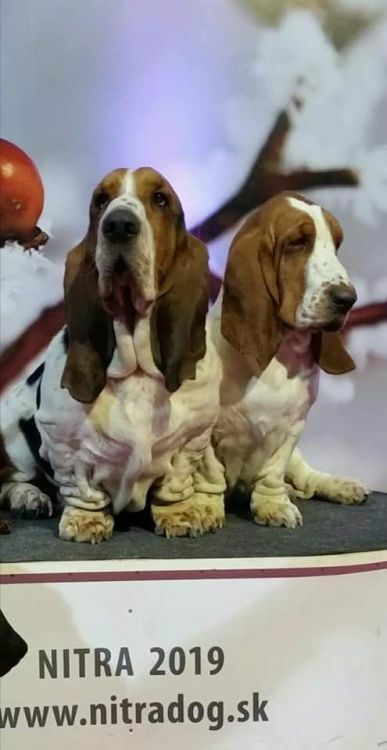 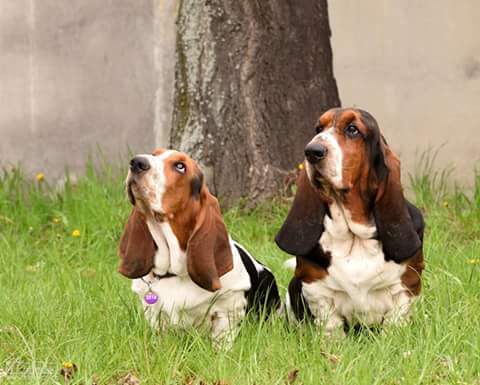 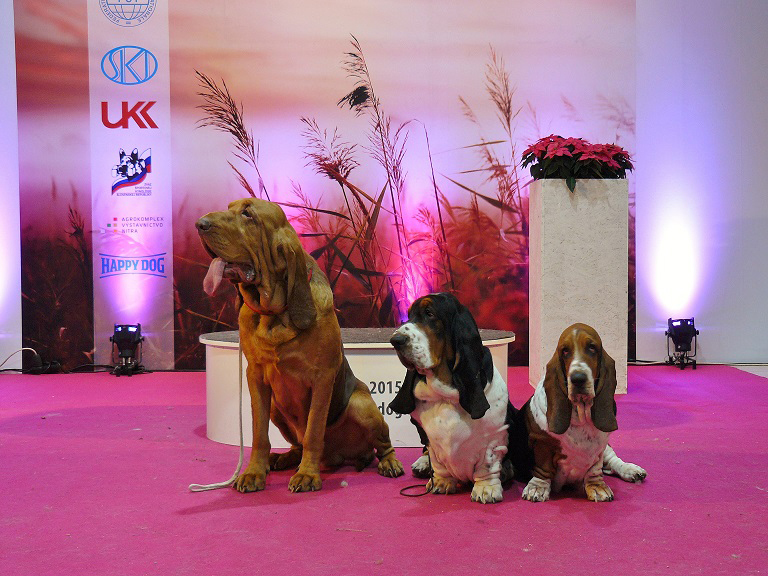 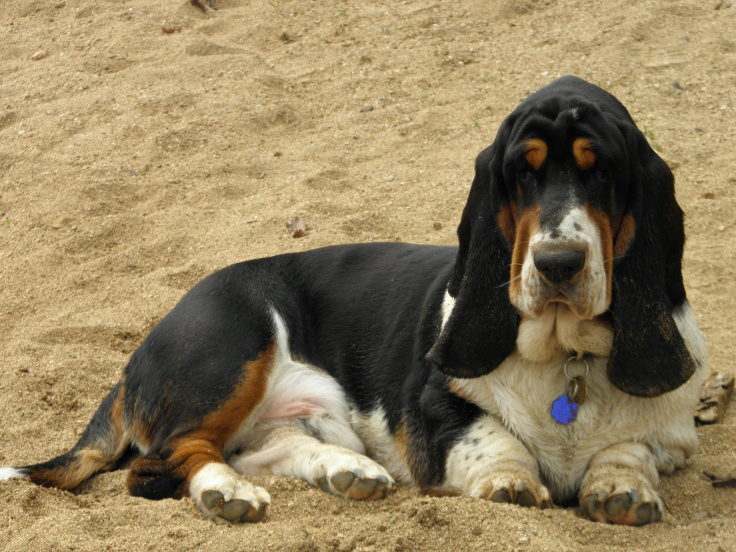 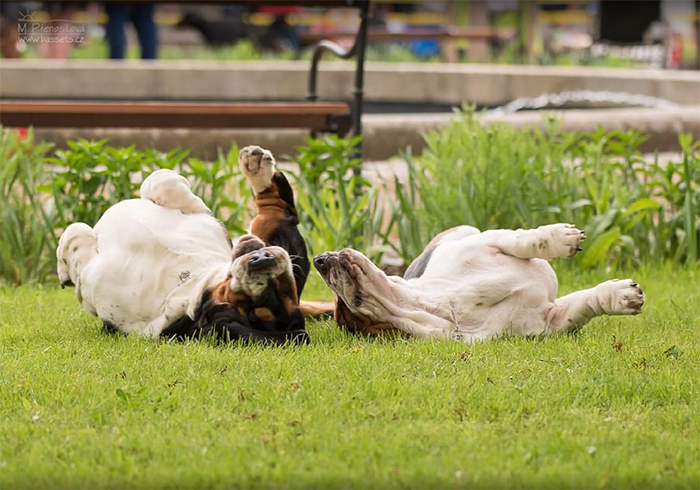 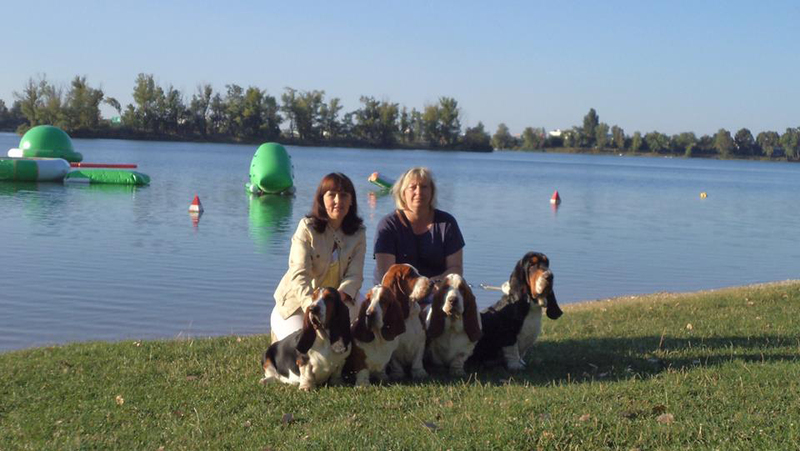 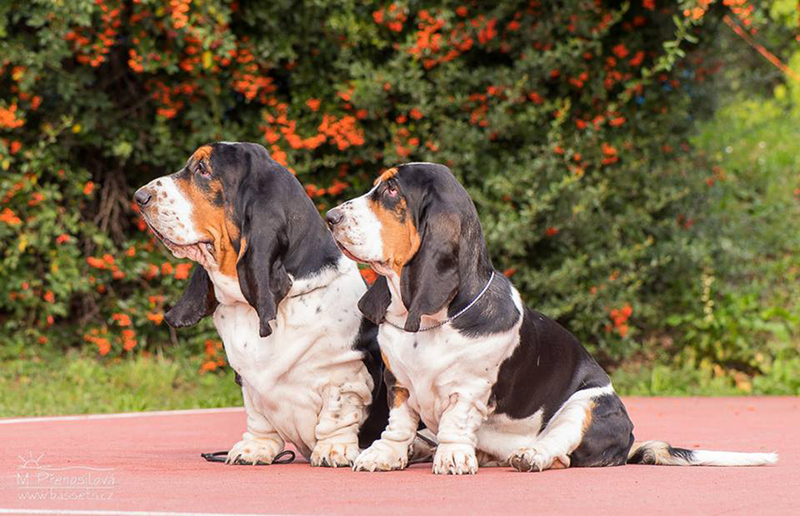 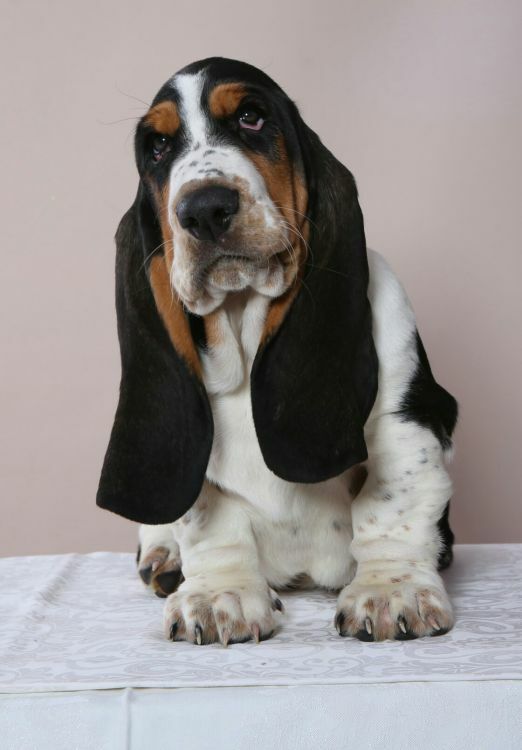 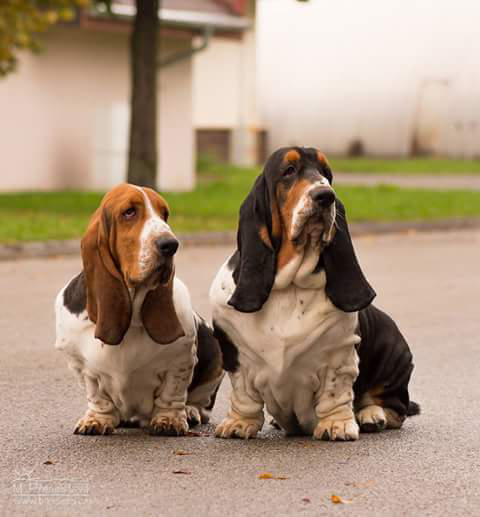 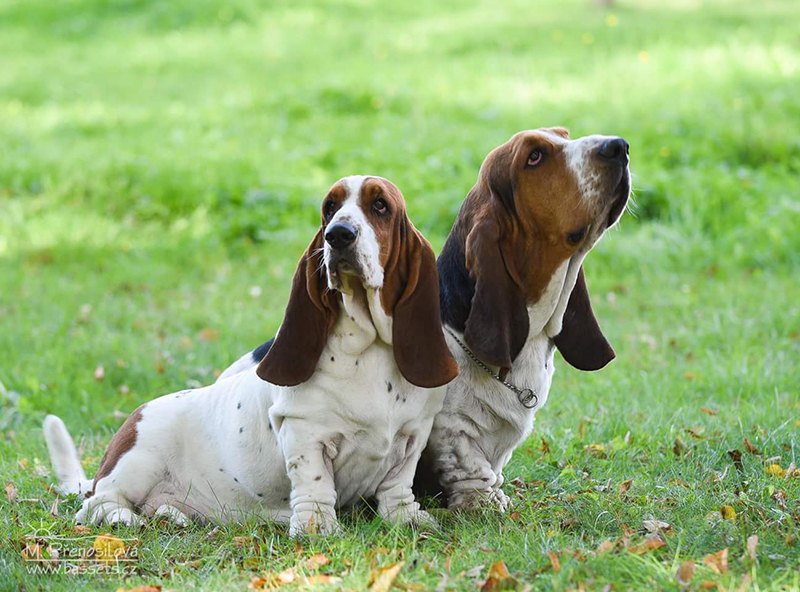 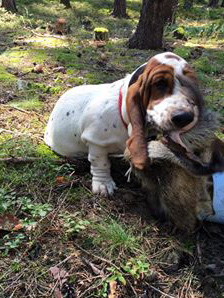 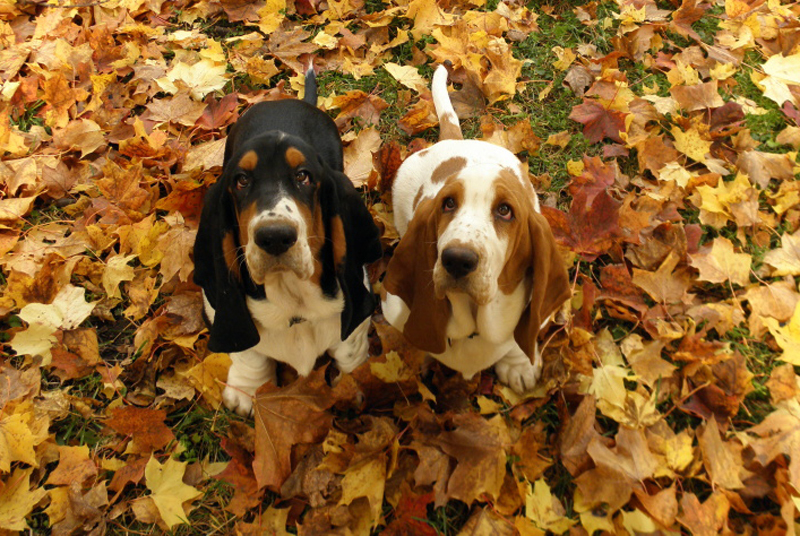 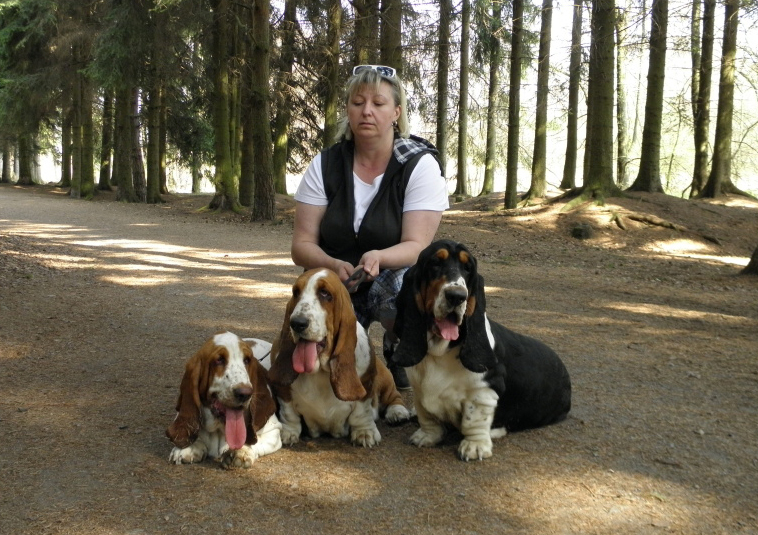 World dog show in Leipzig was very successful for my two basset hounds. 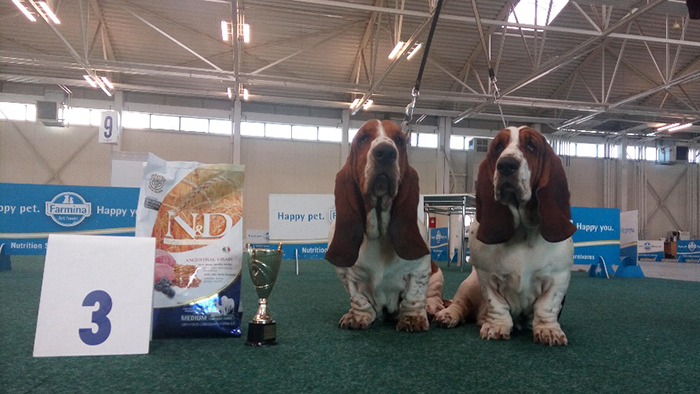 They were both placed 1st in their classes in huge competition. 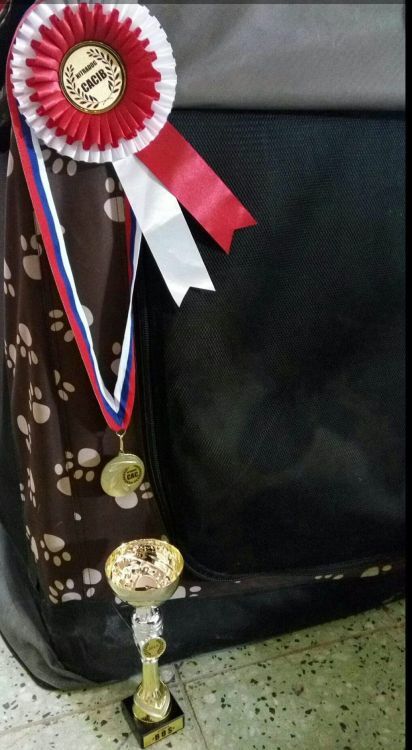 I am over the moon! 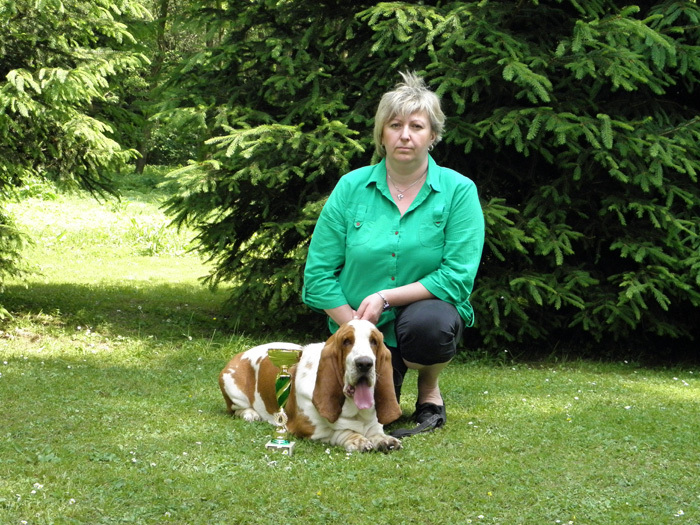 Ester, thank you very much for the lovely moments by your side. 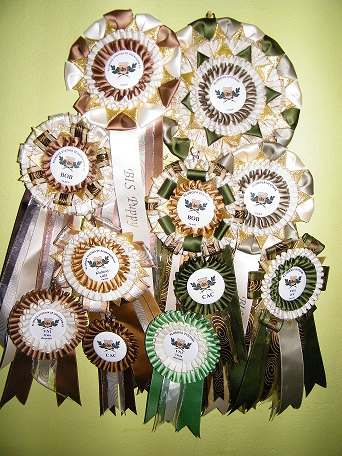 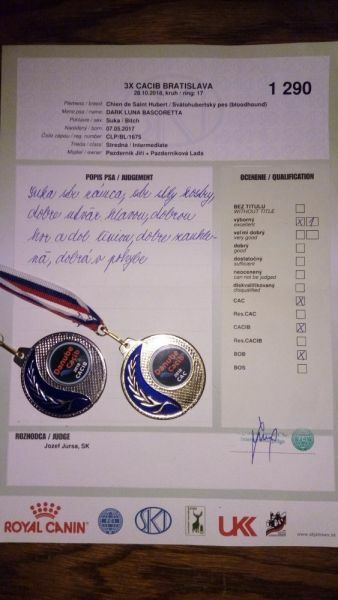 Barnabáš and Pipi were placed 3rd in Braces competition. 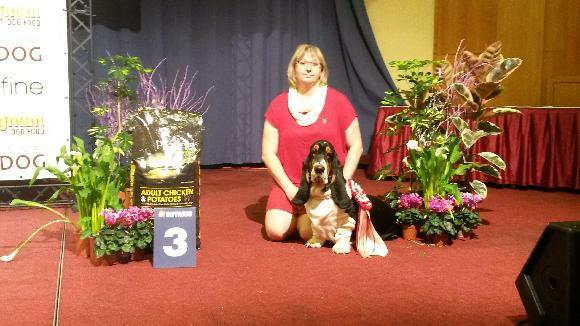 Arthas ze Srdce Brd was 4th in his class. 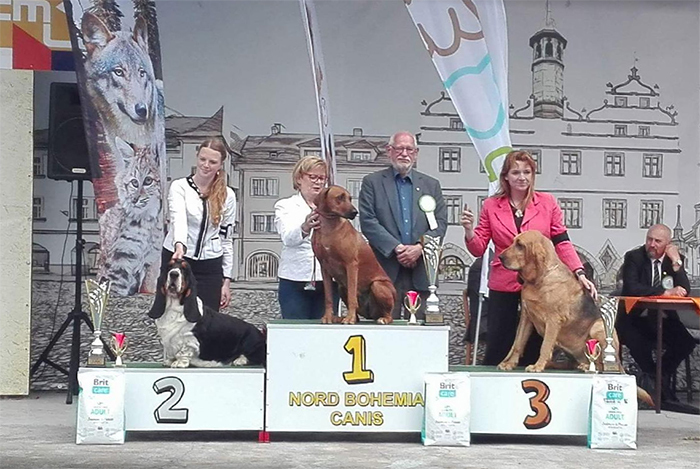 Barnabas became Czech Junior Champion. 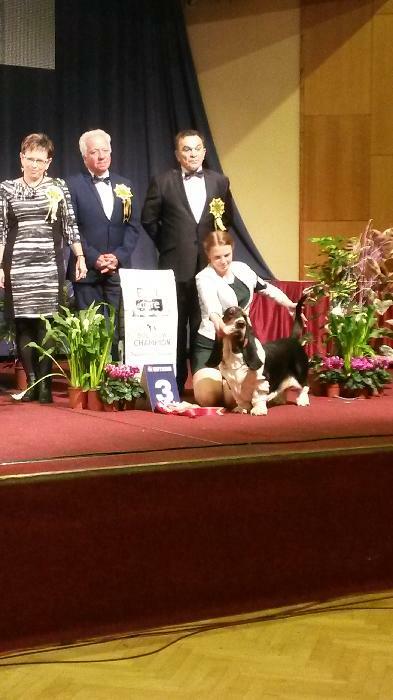 Alexa became Czech Junior Champion. 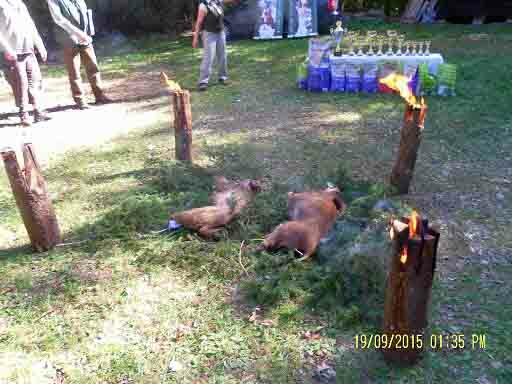 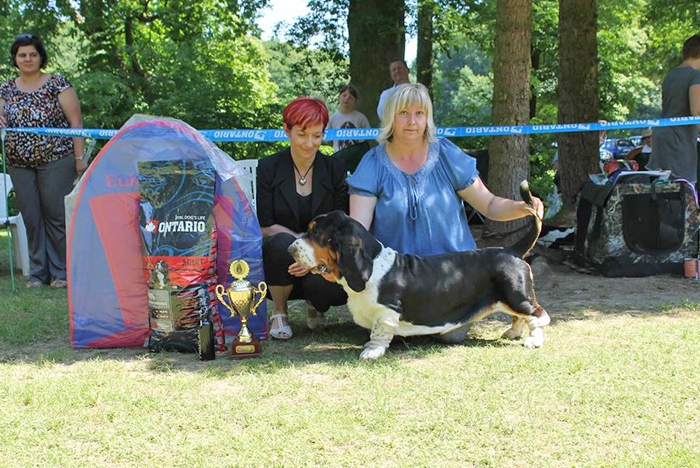 Pipi becamke Slovak puppy champion. 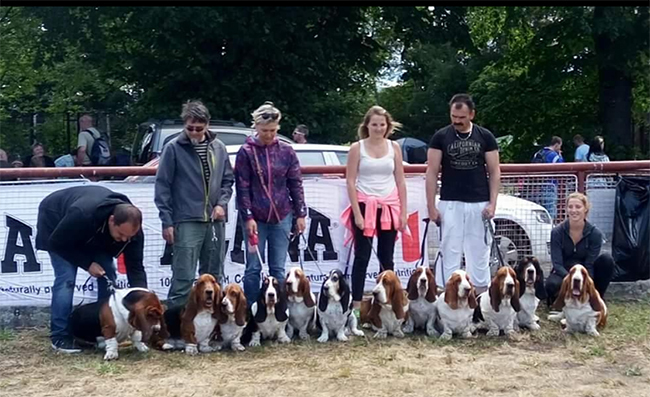 Alexa Aira Bohemika - rCACT | Pipi klanu Piegowatych at traning day BZH-Lavičky. 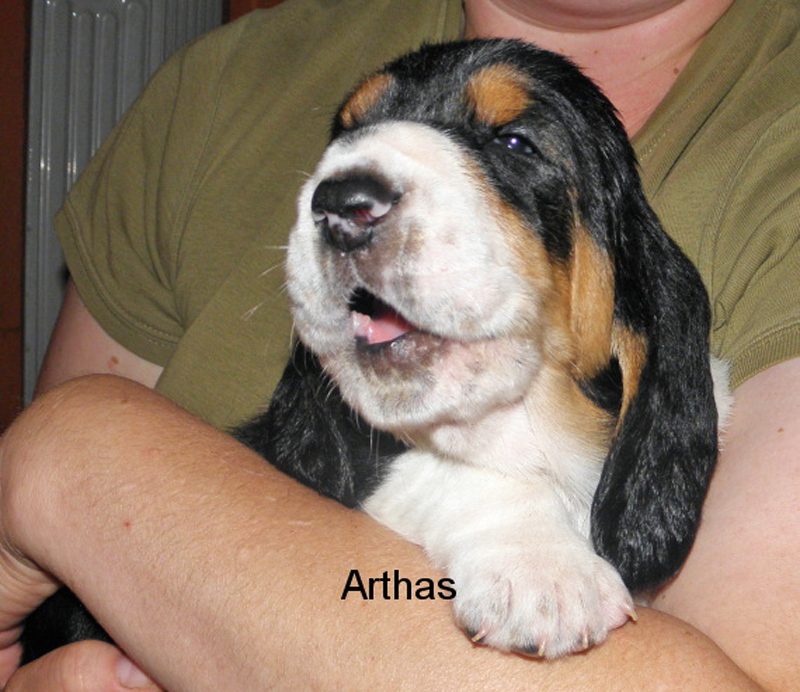 Arthas ze Srdce Brd - Exc. 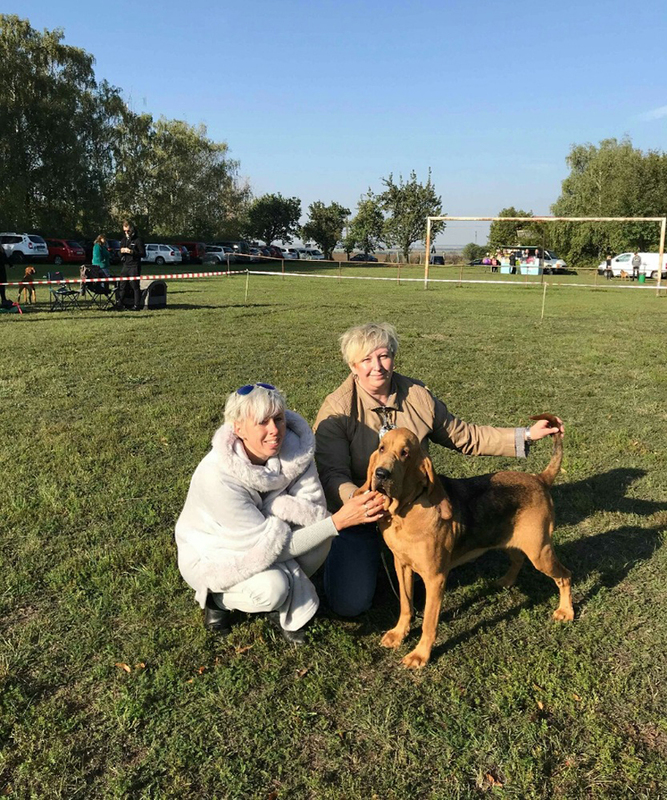 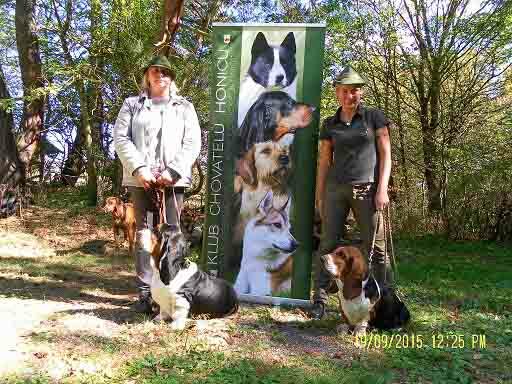 Our new pack member is called Pipi and she is from Poland from kennel klan Piegowatych. 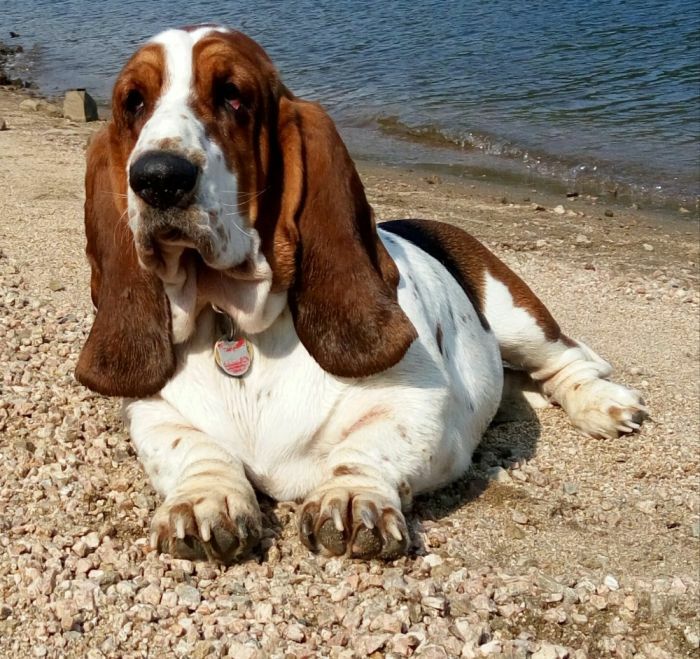 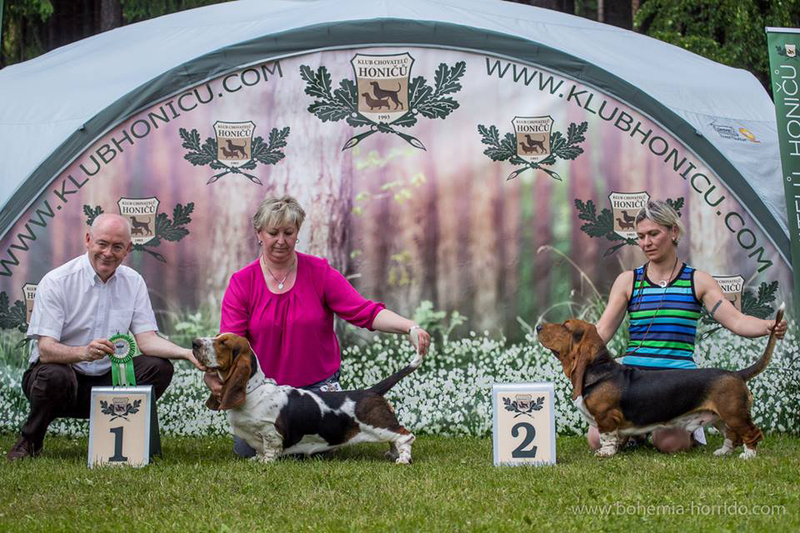 Arthas is now fully qualifies for Club Champion of Basset Club CZ and also Czech Grand Champion. 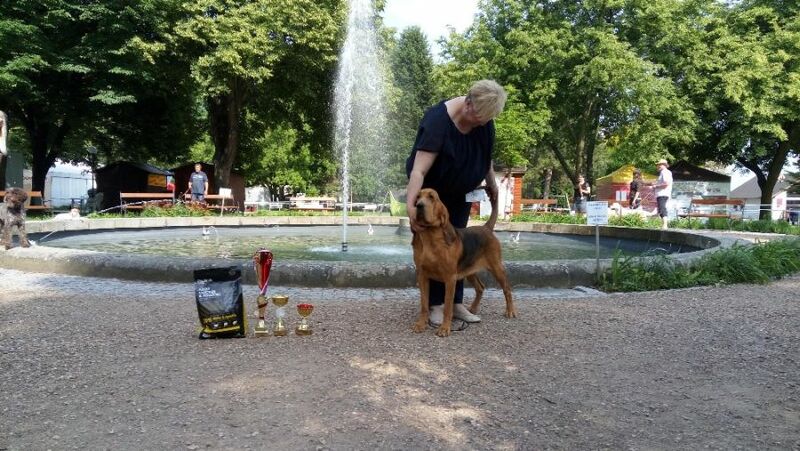 Arthas was awarded by title Slovak Grand Champion. 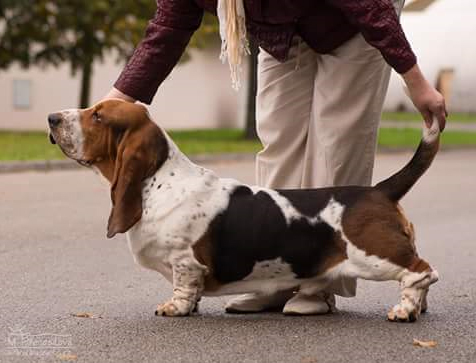 18.2.2016 our girl Brownie went to Tilki Attila to Hungary. 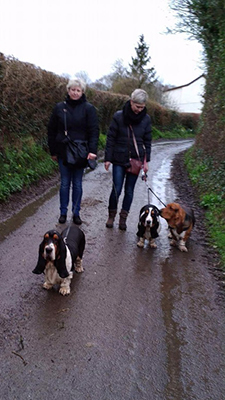 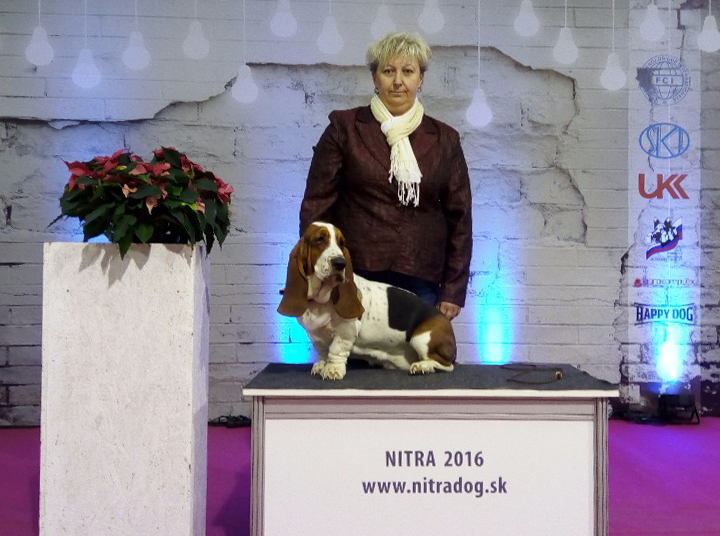 20.2.2016 Balthasar went to his new owner Edith Senft to Switzerland and Bonifac to his new family, Hana and Karel Perďoch to Rudimov u Zlína. 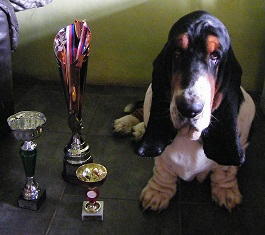 Arthas is now Czech Champion, Champion ČMKU and Alexa is Junior Champion. 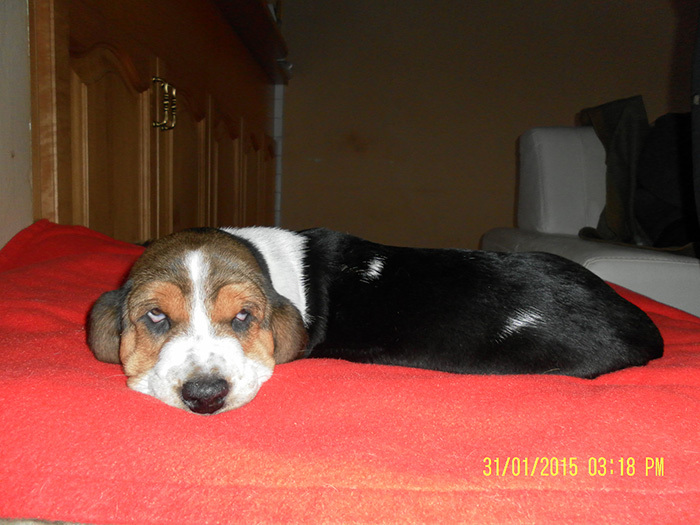 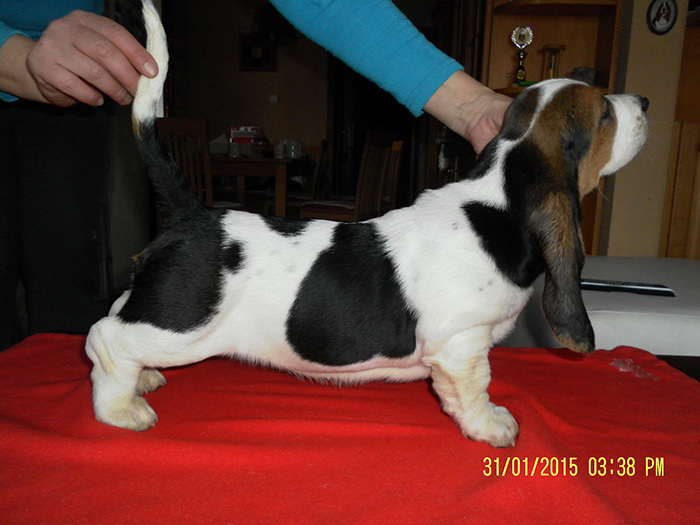 More info at www.basset-caltha.cz or by email lesisou@seznam.cz. 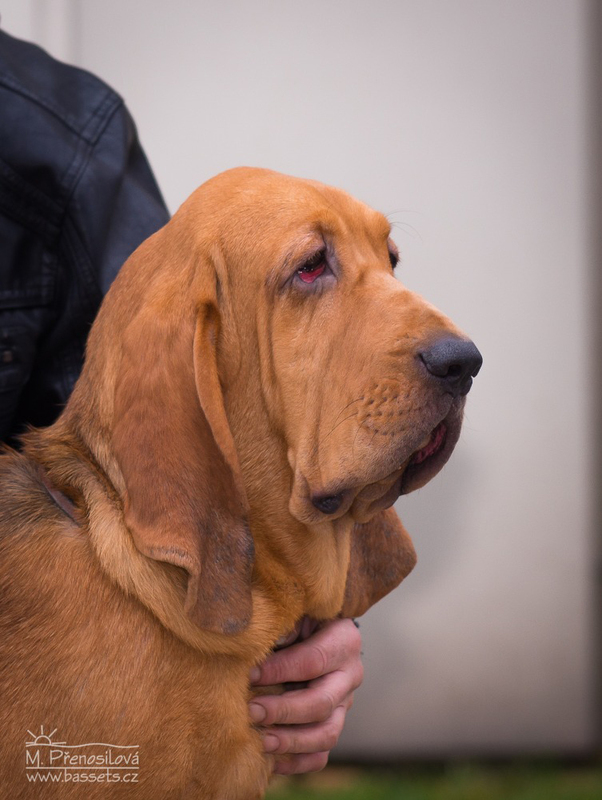 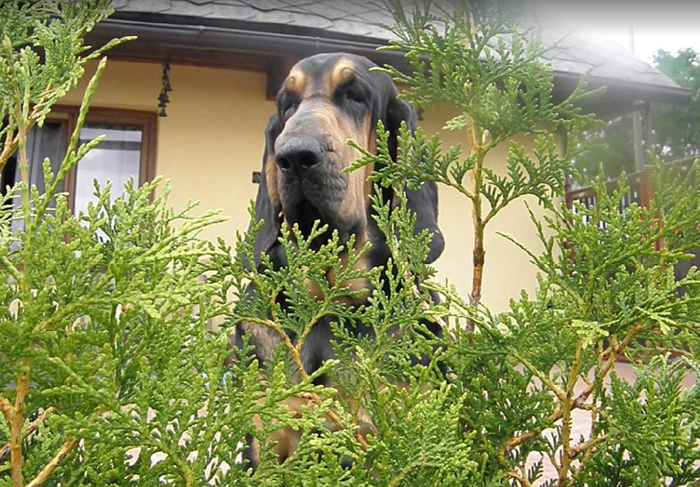 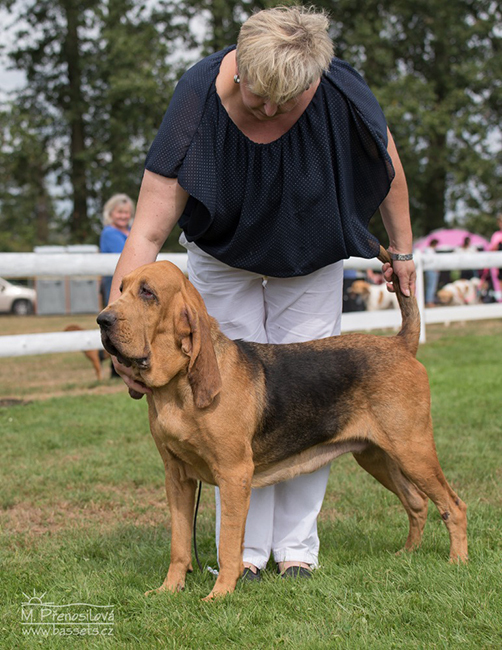 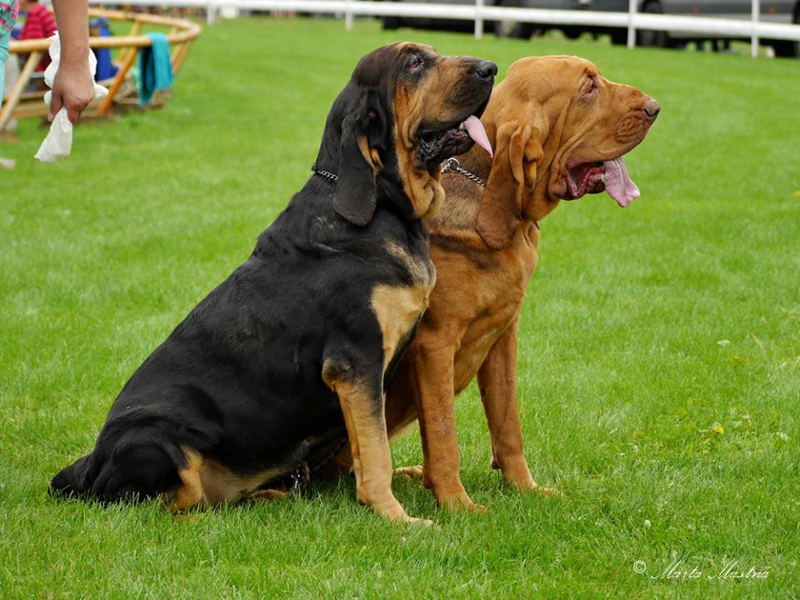 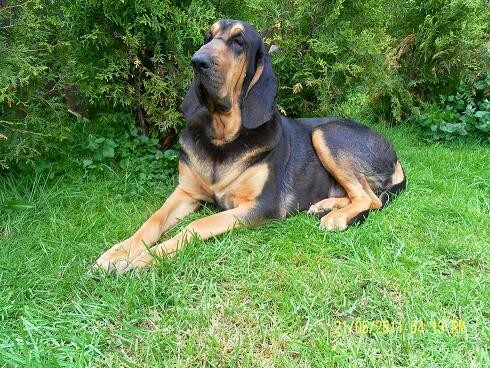 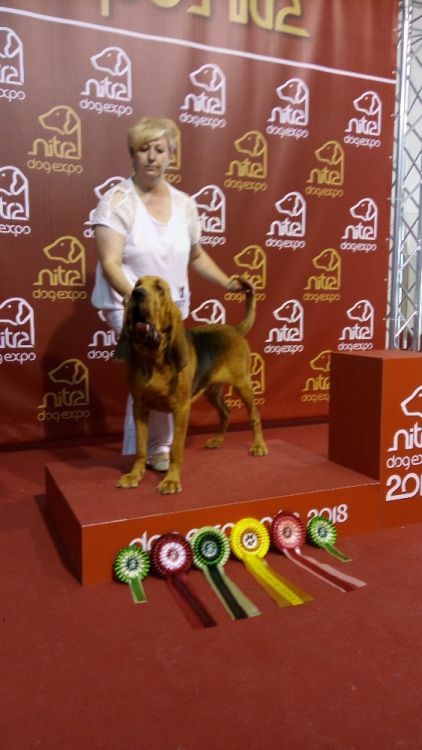 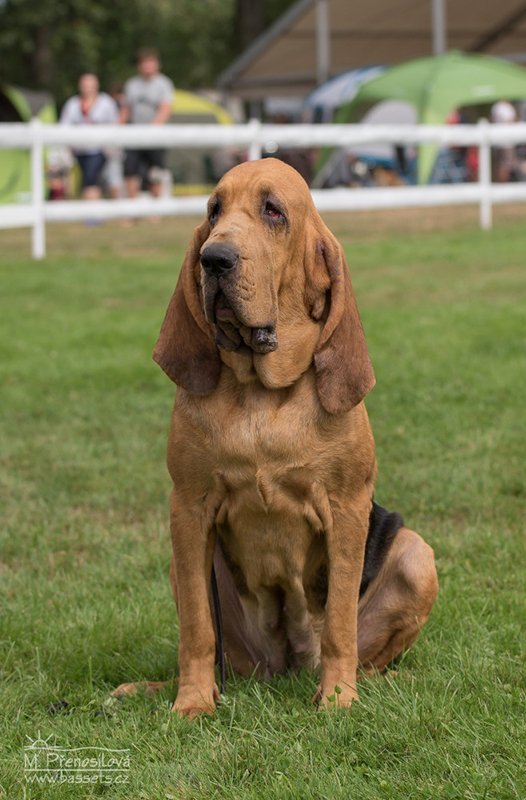 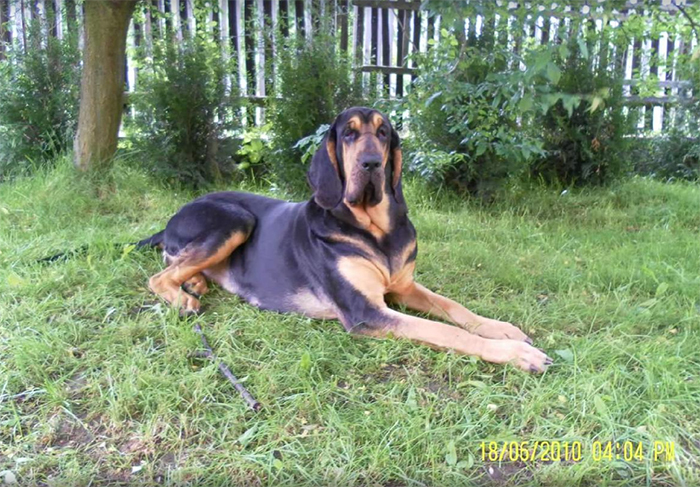 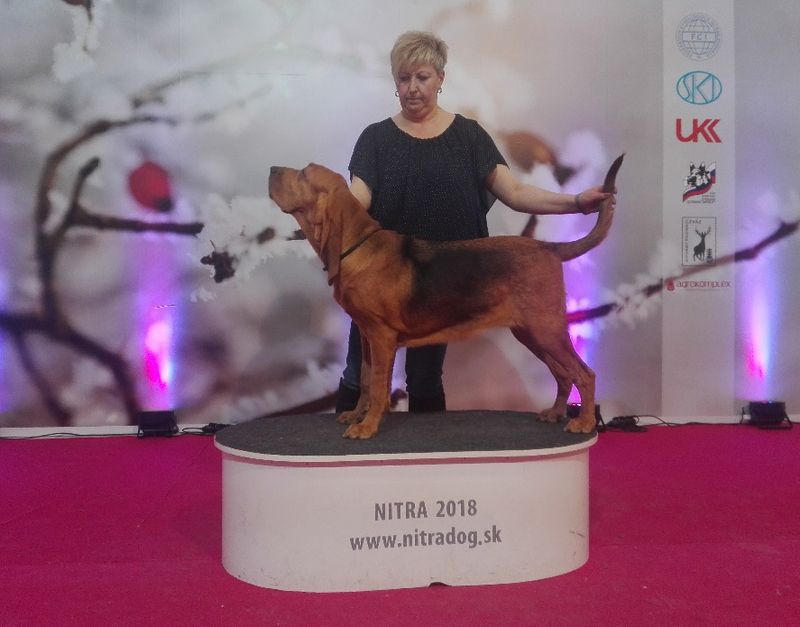 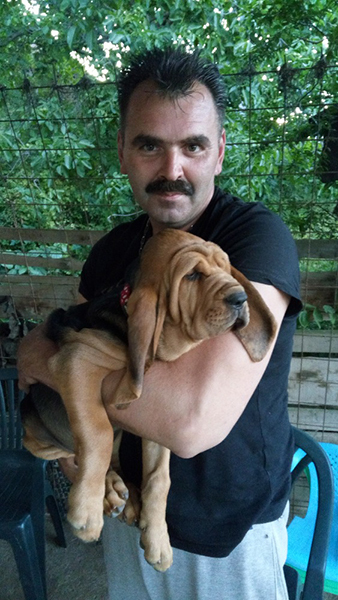 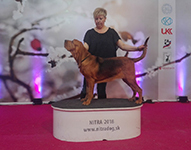 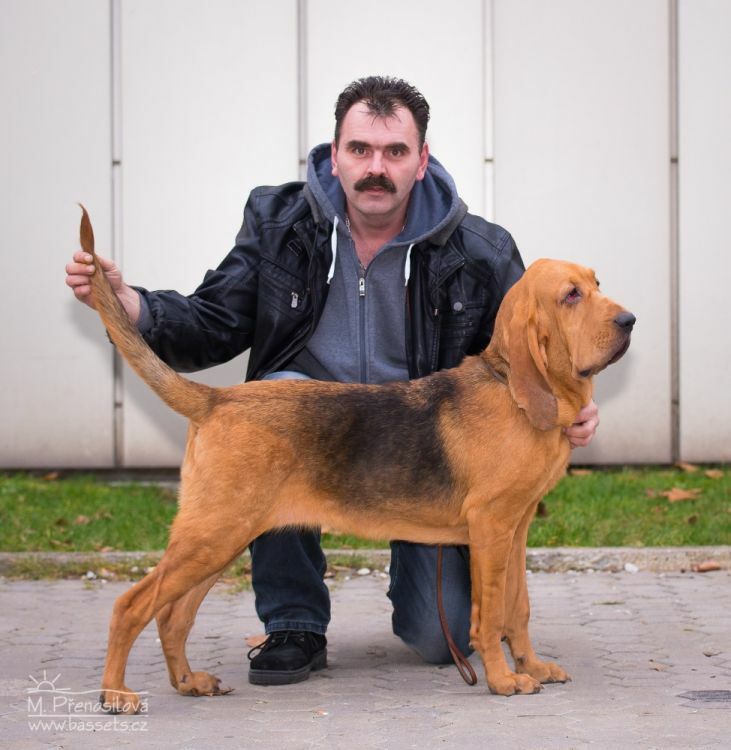 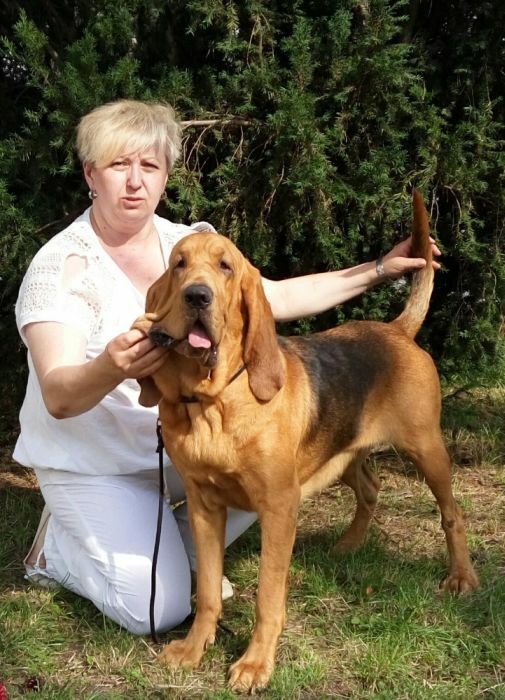 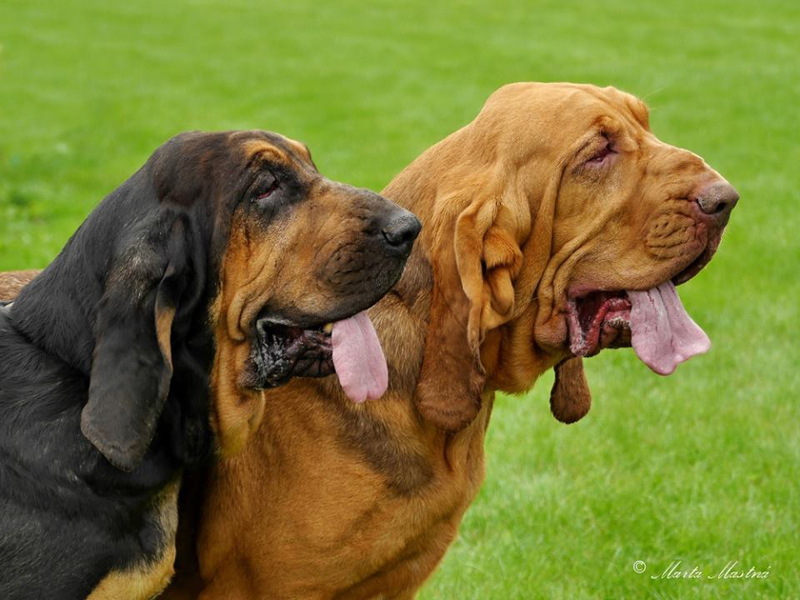 Our bloodhound Ester z Křivoklátských hvozdů and Koloděj Roborovski. 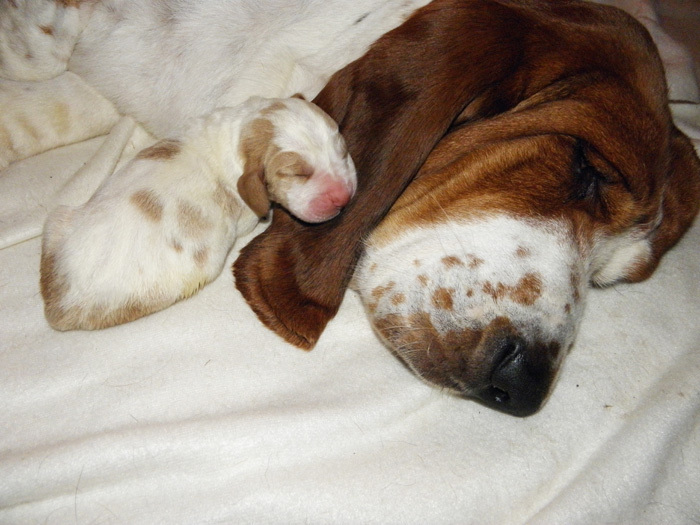 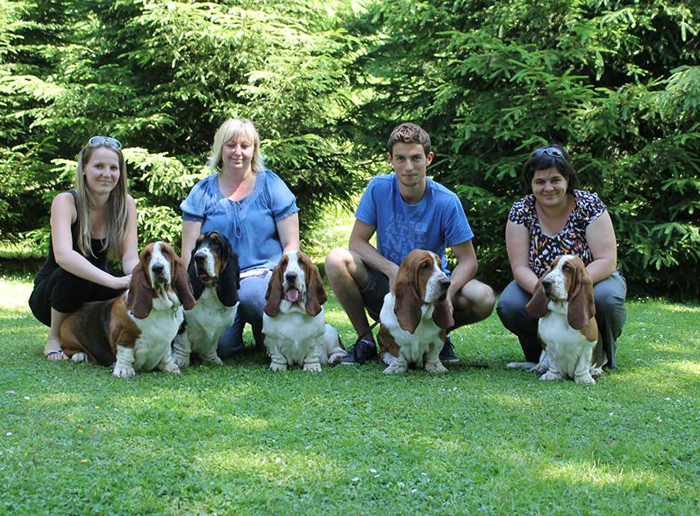 Puppies will be born around 25th September 2015. 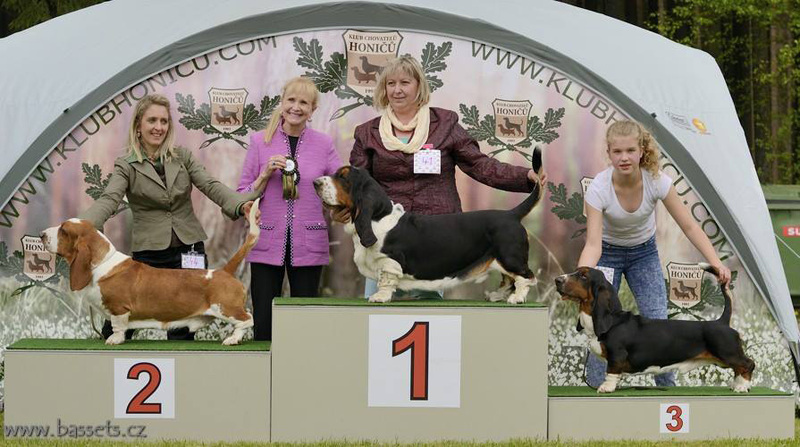 More info at website www.basset-caltha.cz or by email lesisou@seznam.cz. 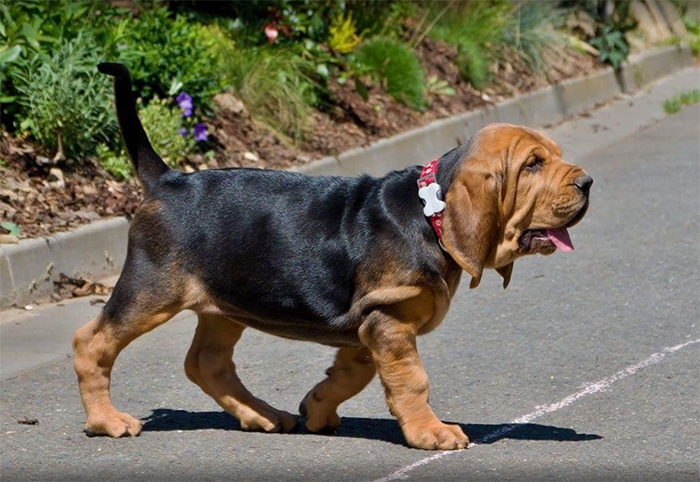 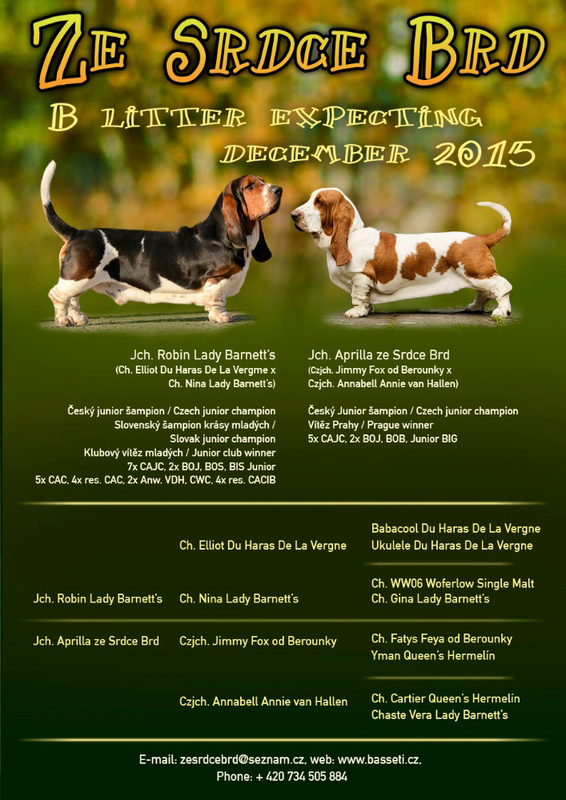 Dam of the very first litter sired by Arthas is Lucrecie od Berounky (pedigree: HERE). 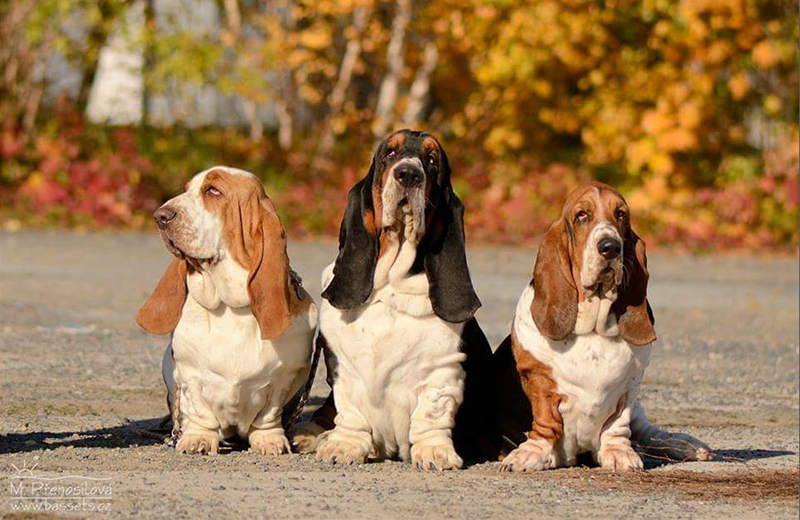 All girls from the litter are available, boys are reserved. 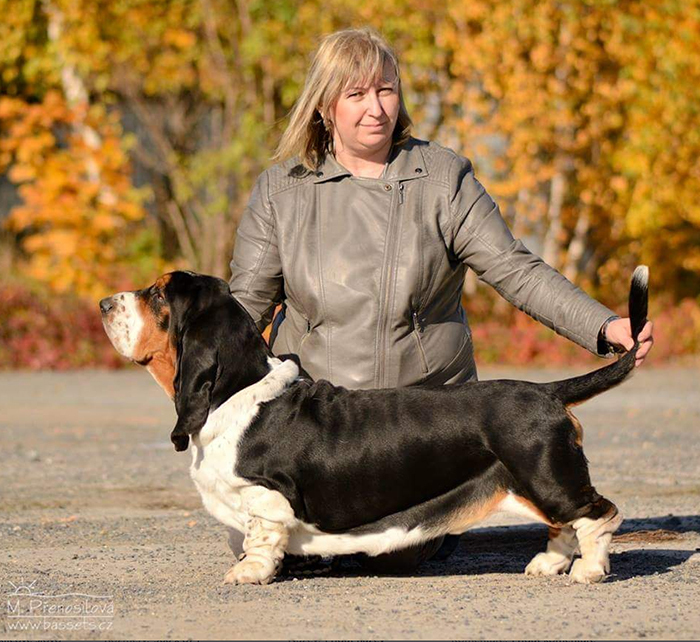 Please contact breeder Věra Otevřelová in case of interest - OtevrelovaV@seznam.cz. 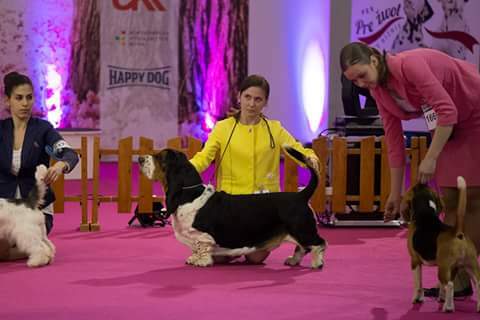 Our little girl is getting to know the show buzz in Pargue. 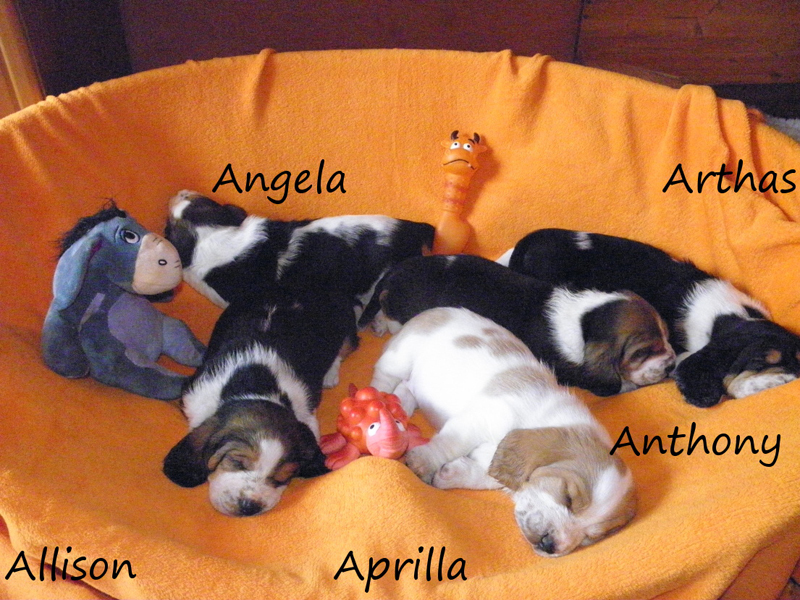 Annabell Annie van Hallen, Arthas, Aprilla, Anthony, Angella ze Srdce Brd. 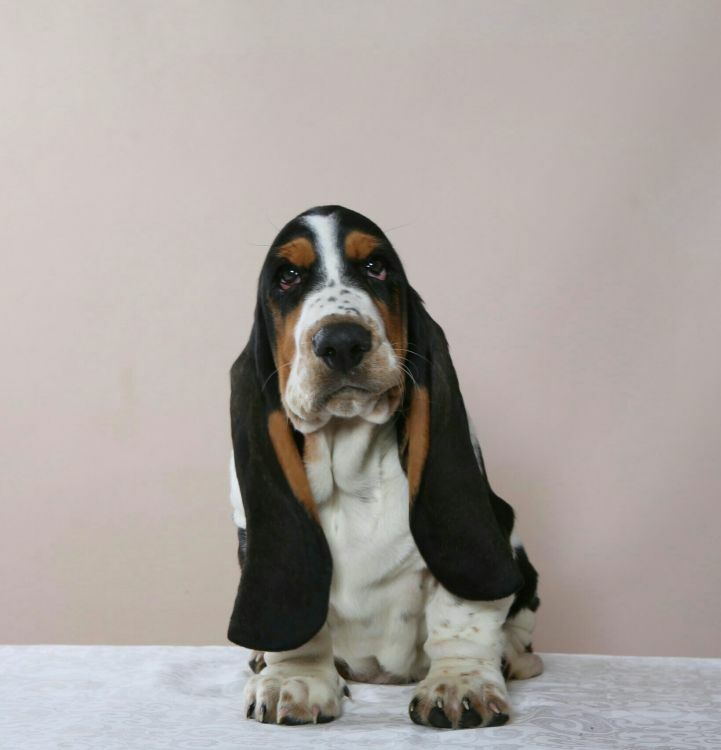 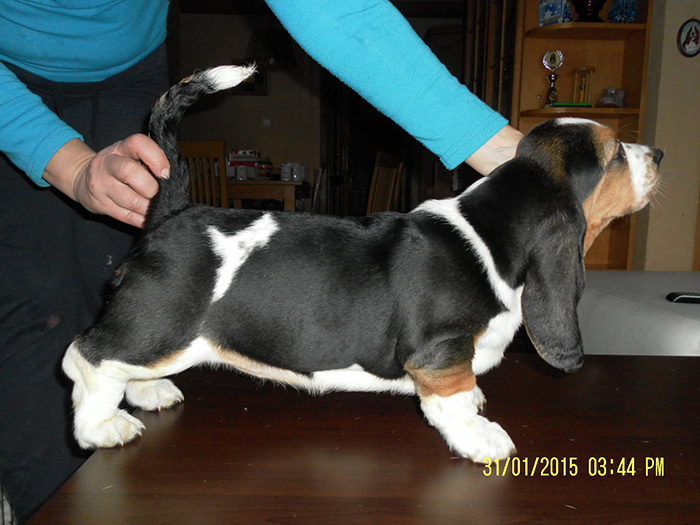 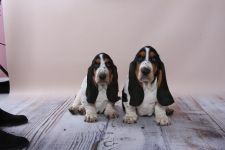 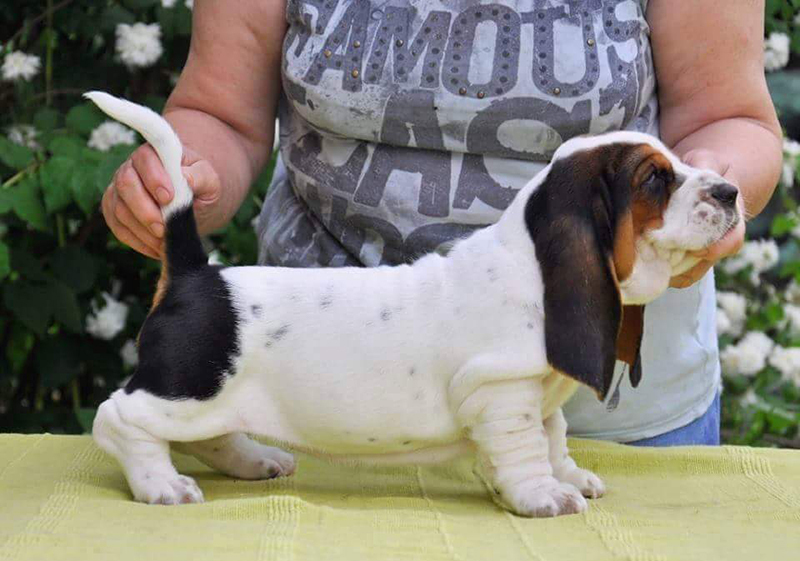 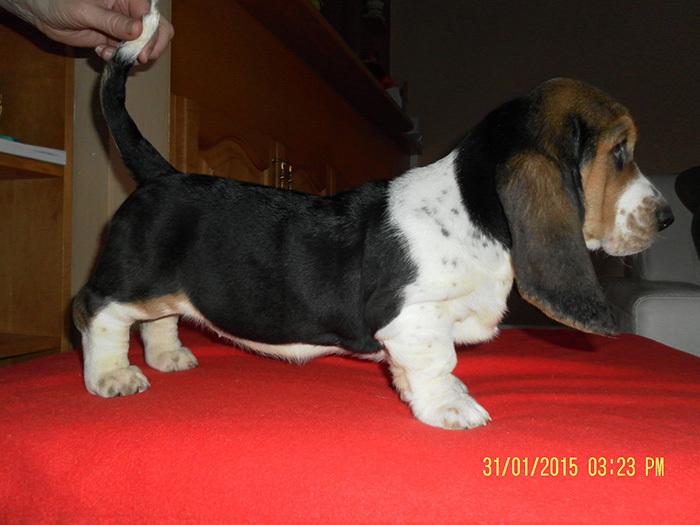 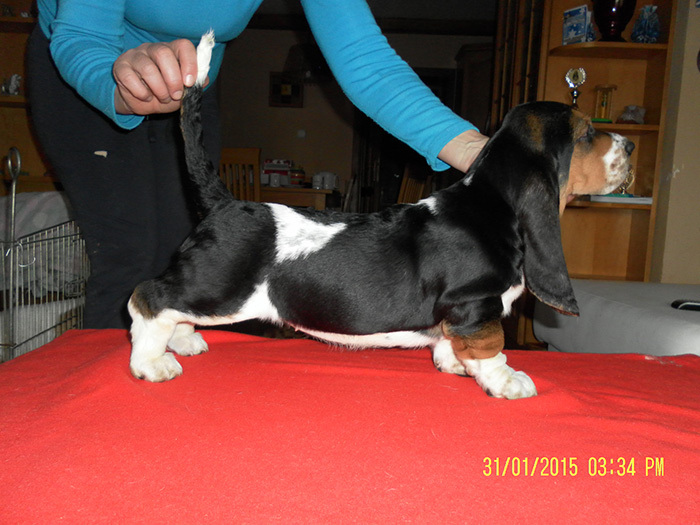 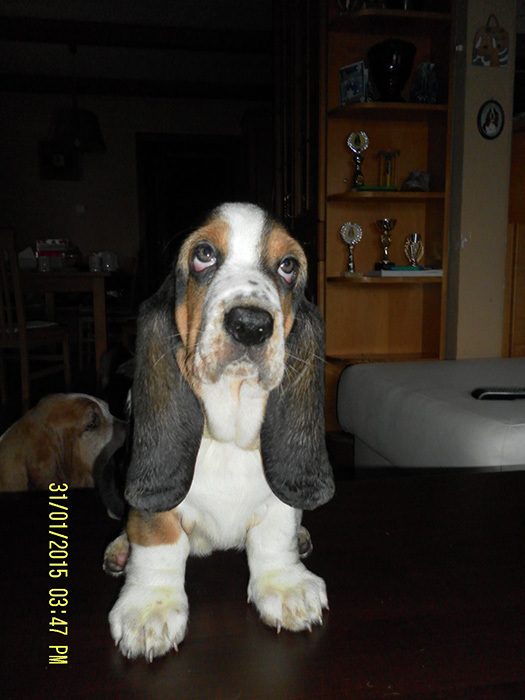 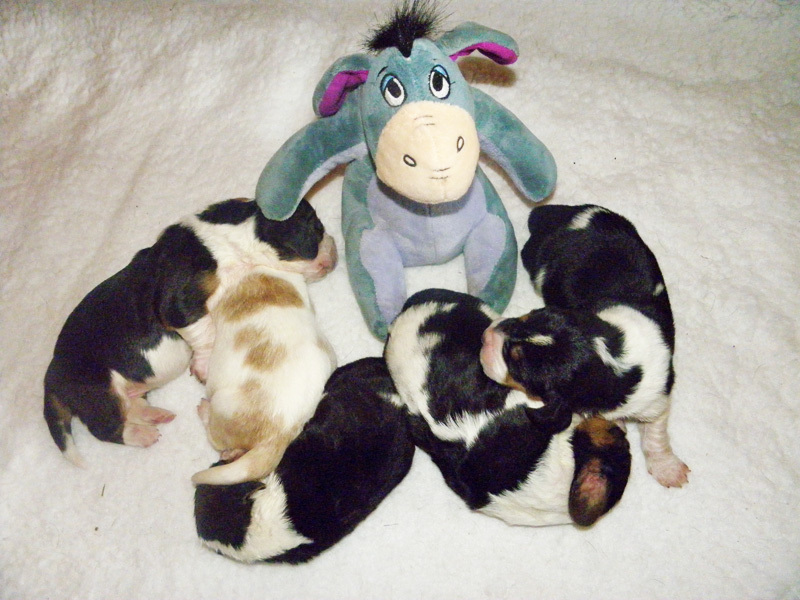 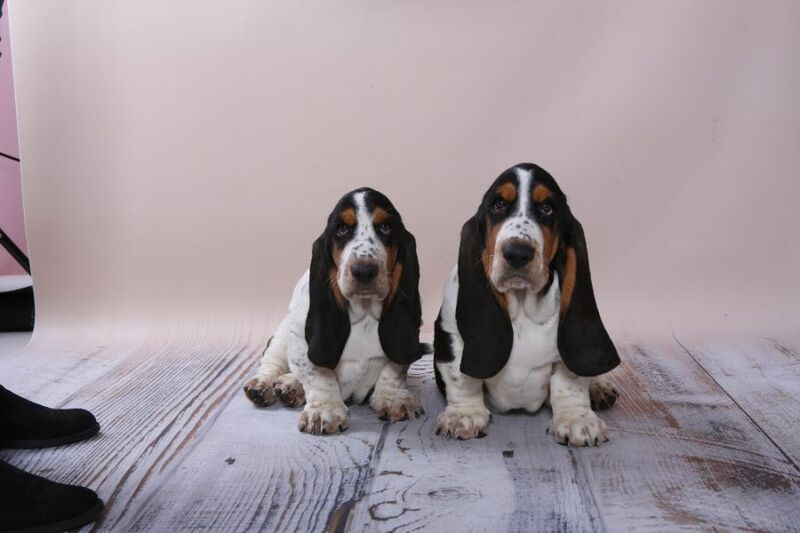 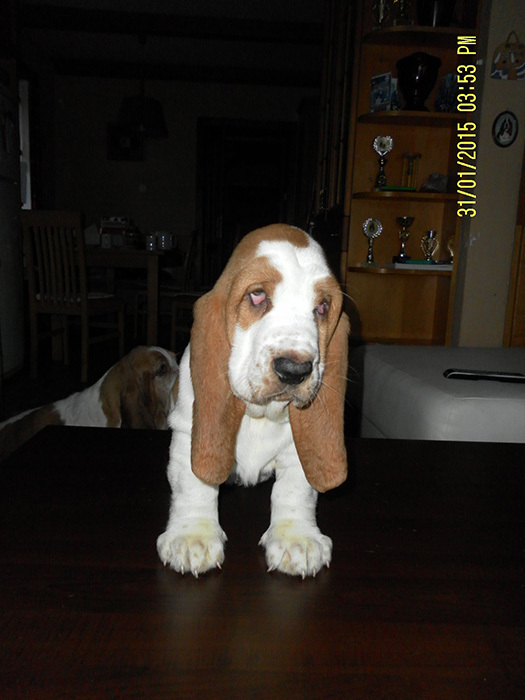 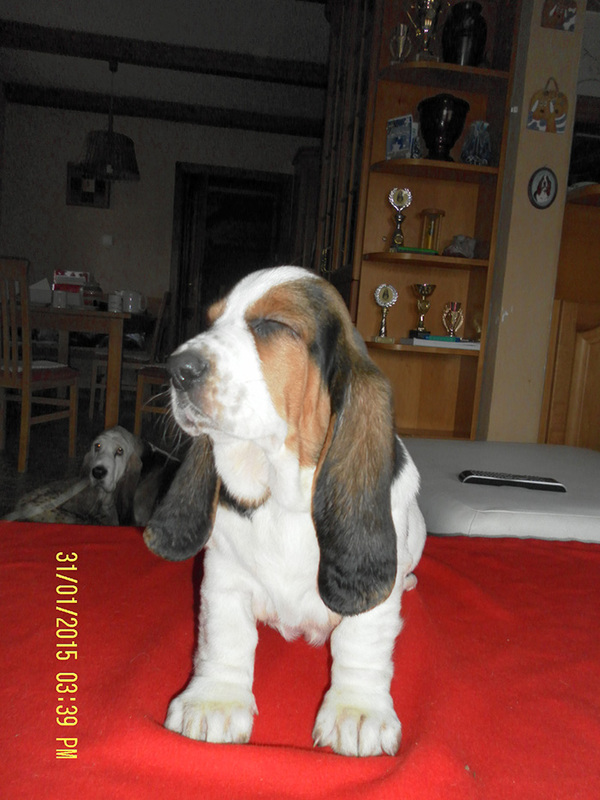 Kennel Roborovski (breeder Lenka Kopecká) has porcelaine puppies available. 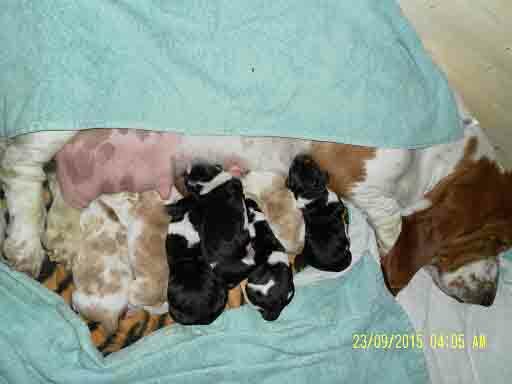 Litter A was born - 2 boys and 3 girls, one female is red and white, the others are tricolour. 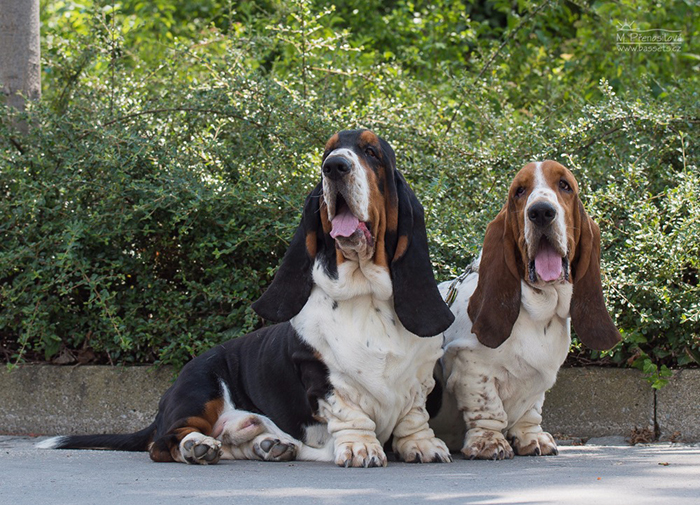 Tricolour males: Artas and Anthony. 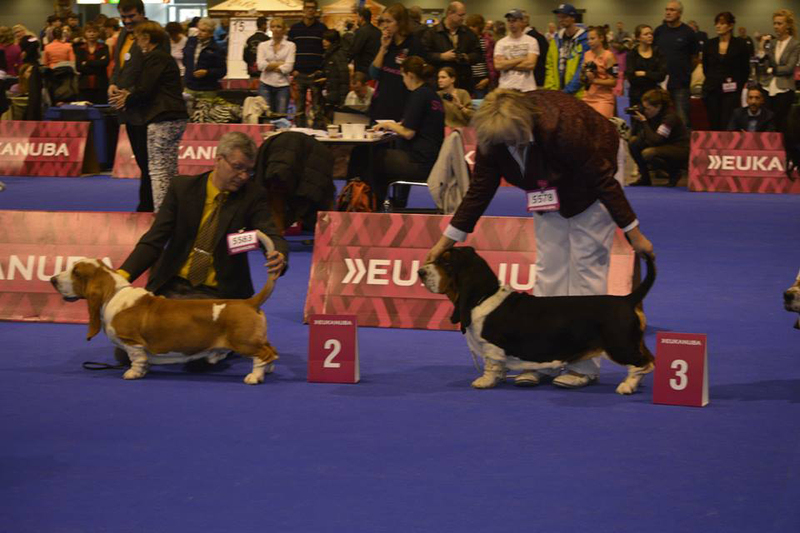 Red and white girl Aprilla and tricolour girls Allison and Angela. 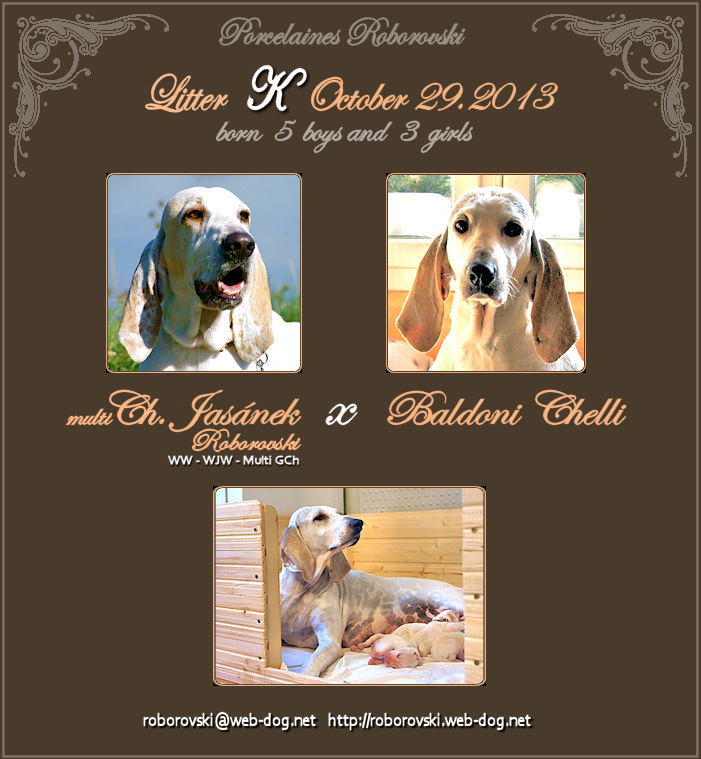 Annabell Annie van Hallen and Jimmy Fox od Berounky are expecting their very first litter, which should be born 5.7.2013. 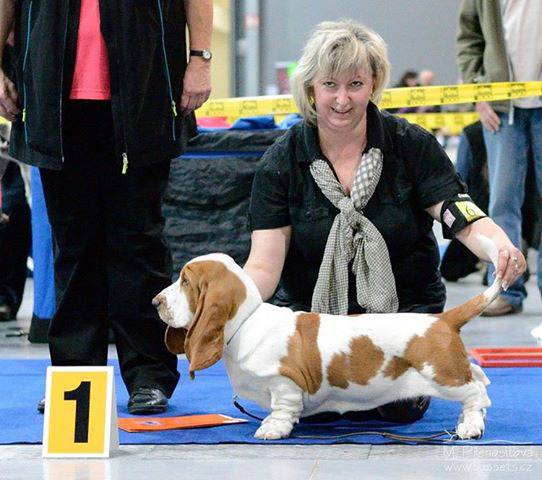 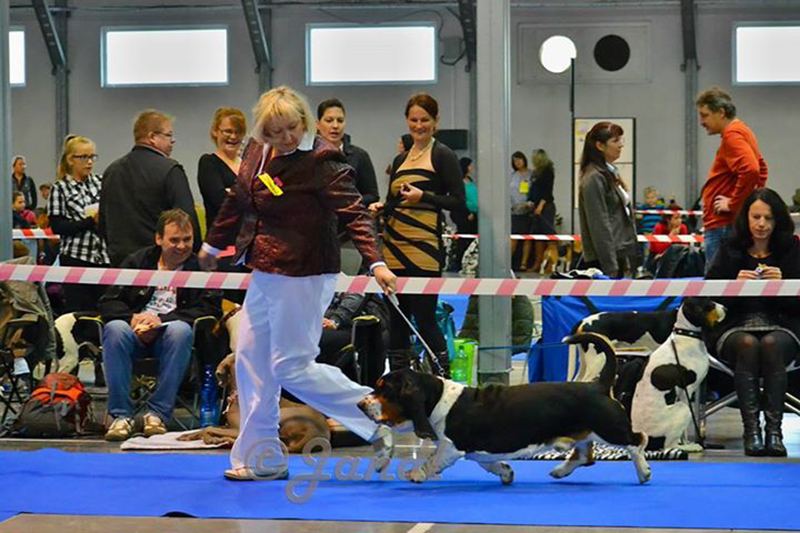 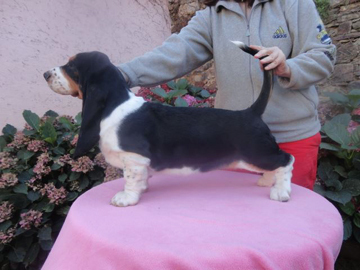 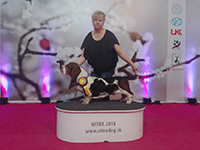 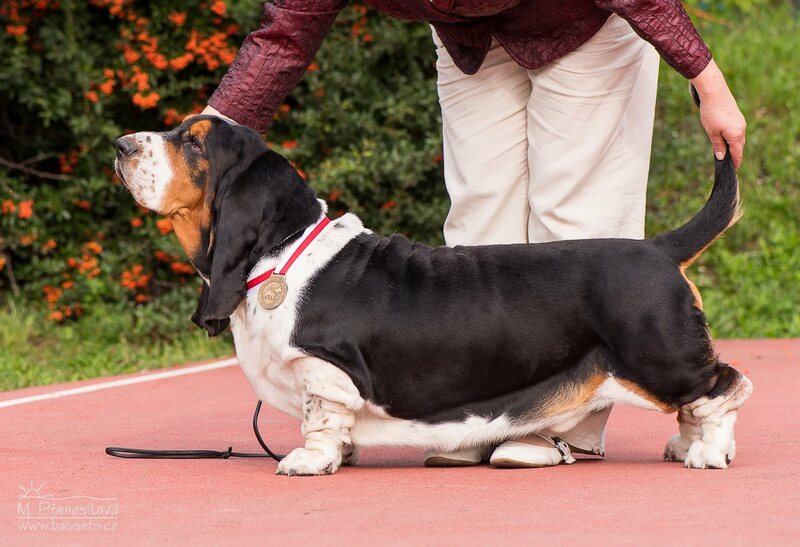 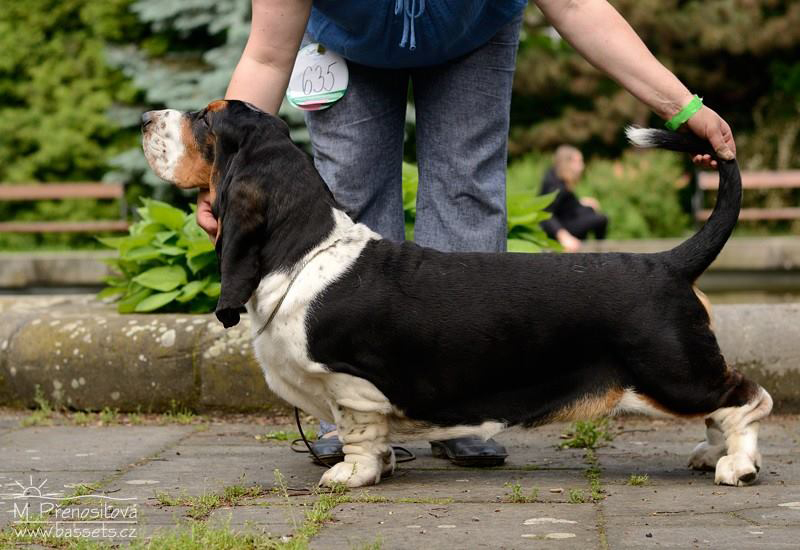 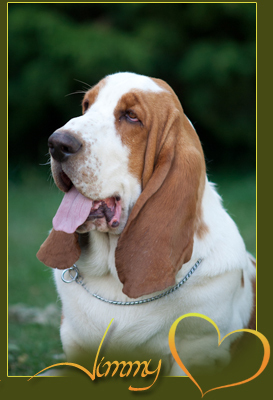 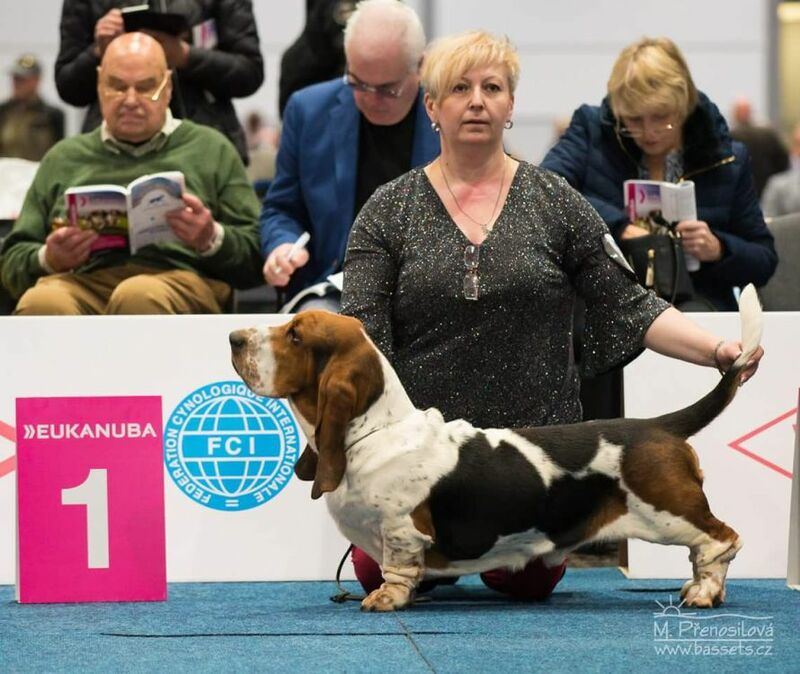 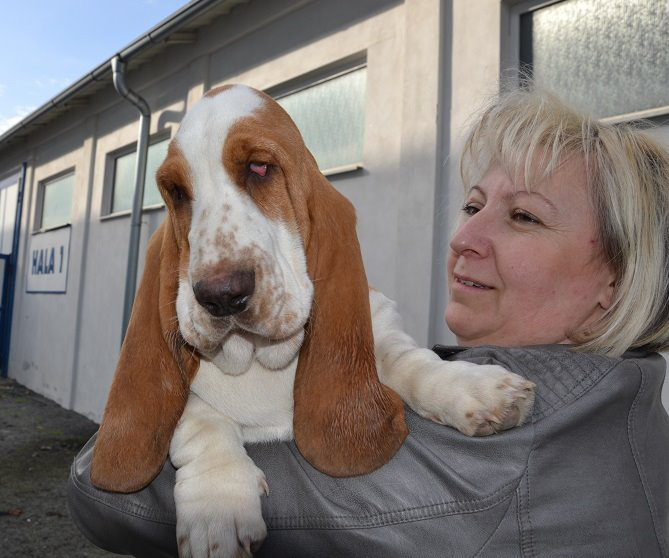 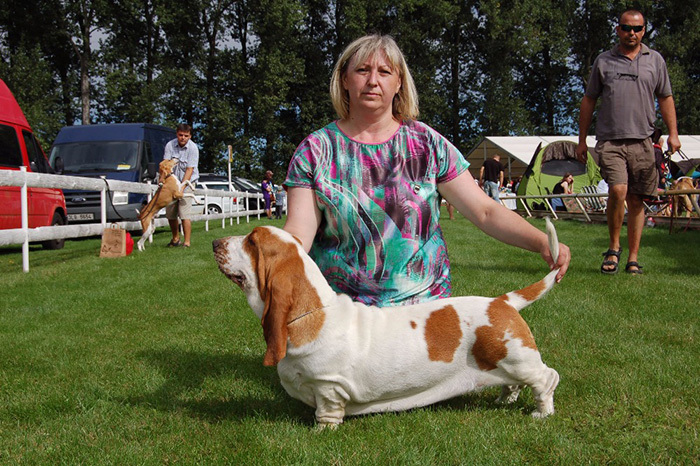 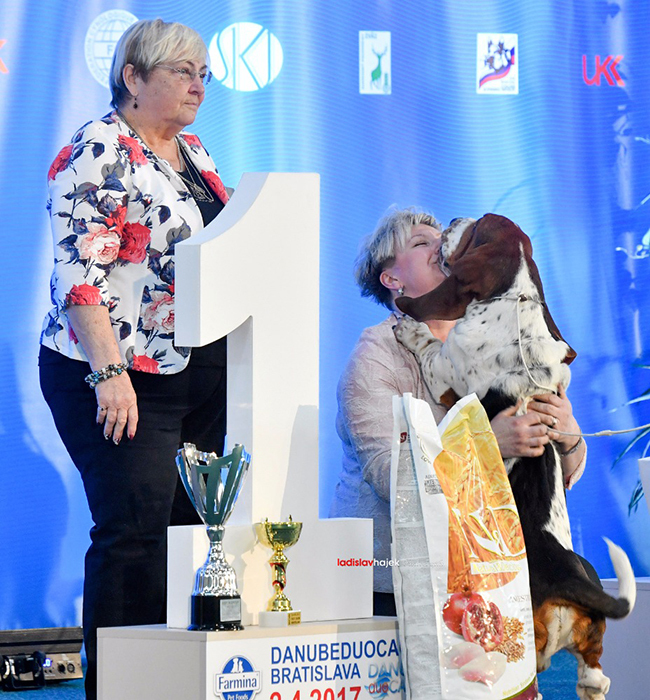 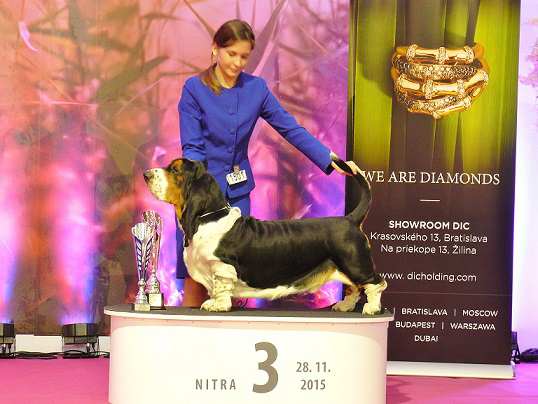 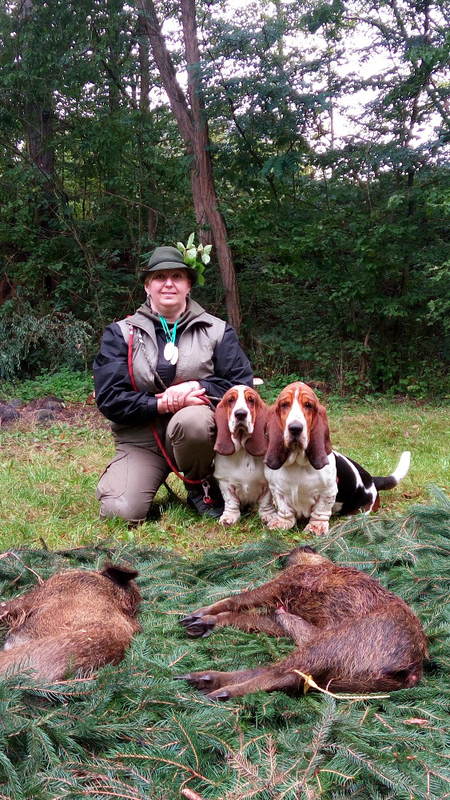 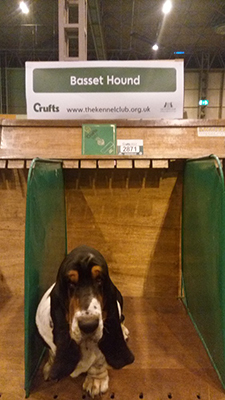 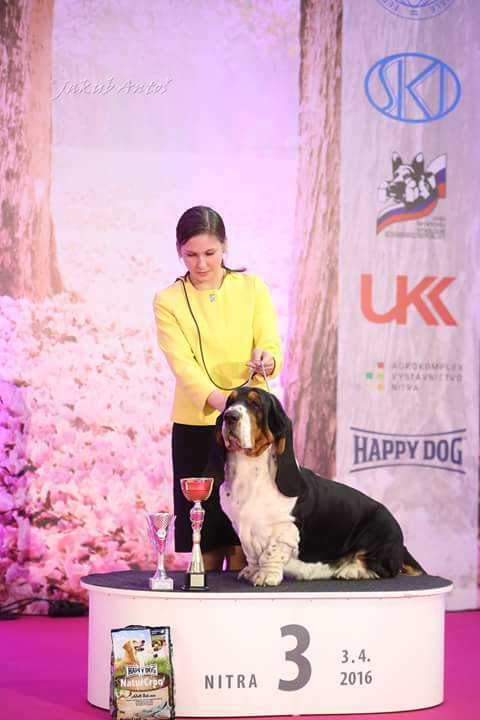 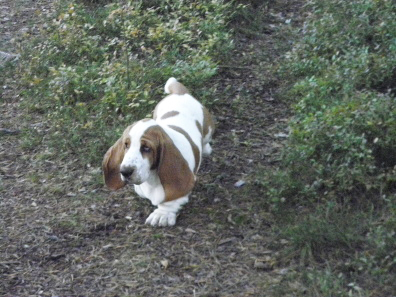 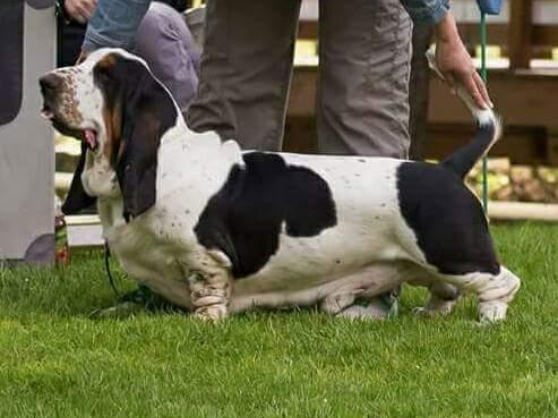 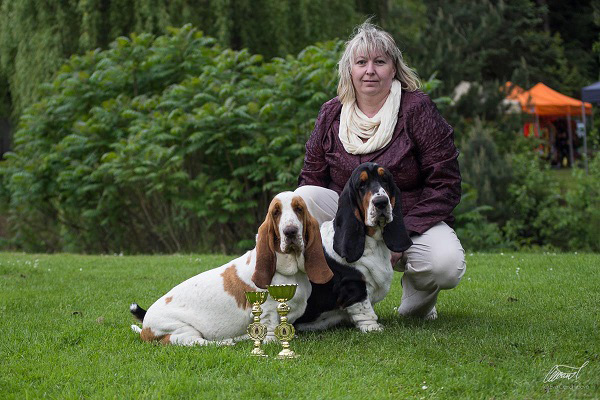 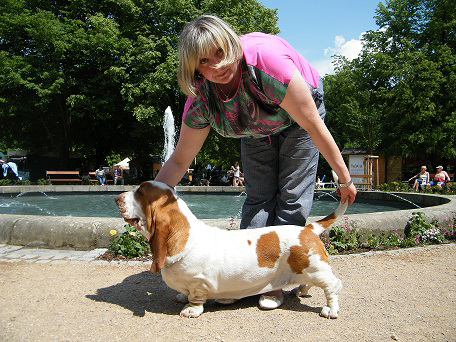 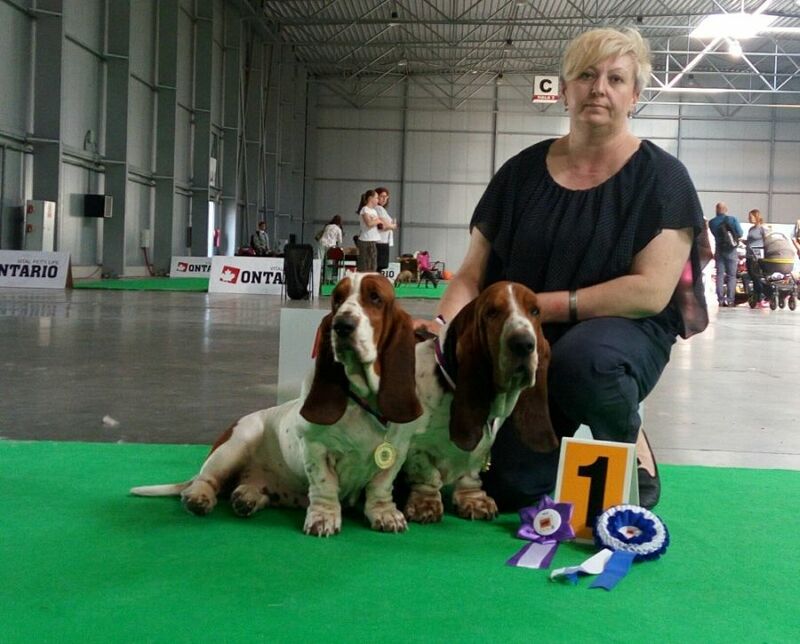 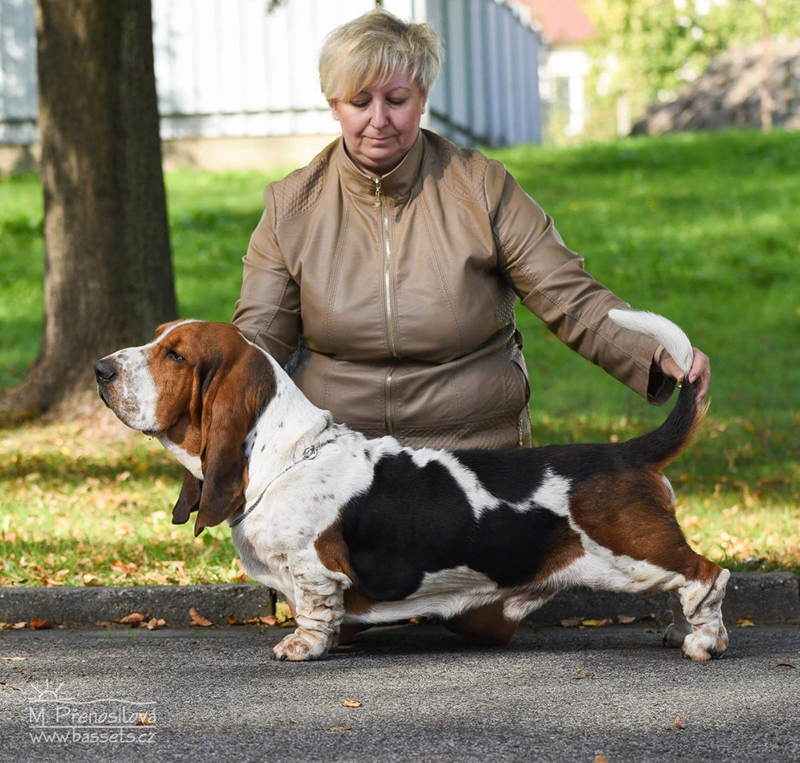 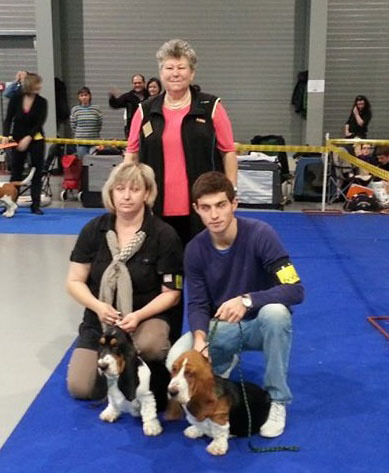 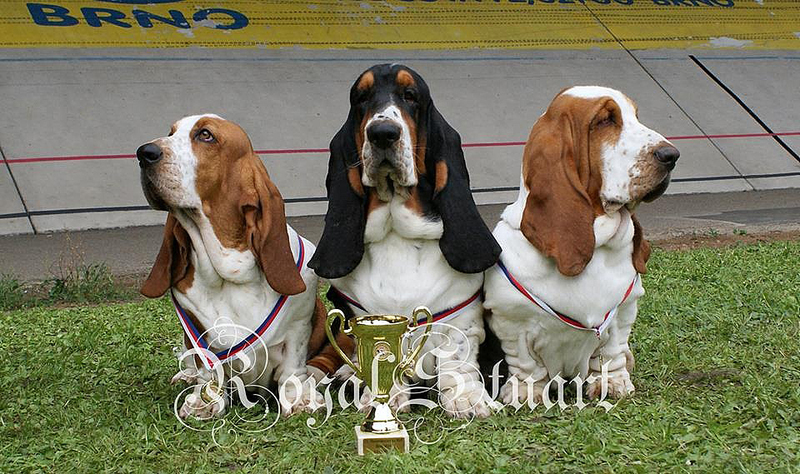 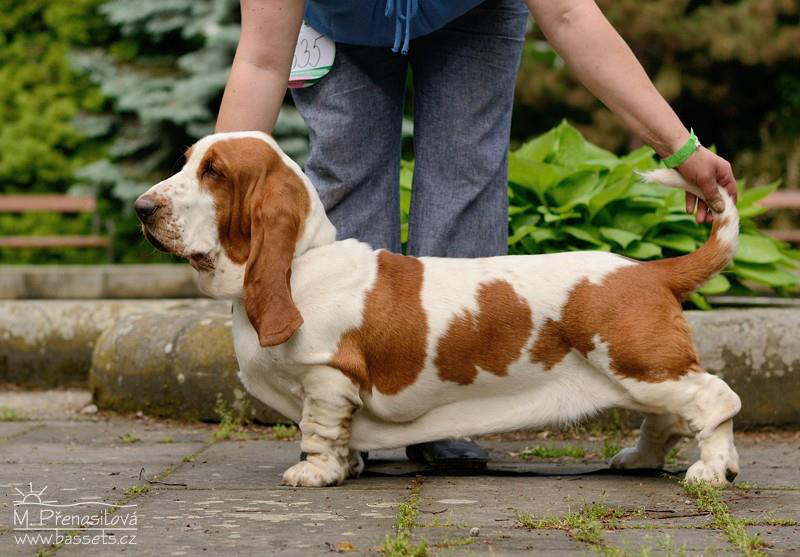 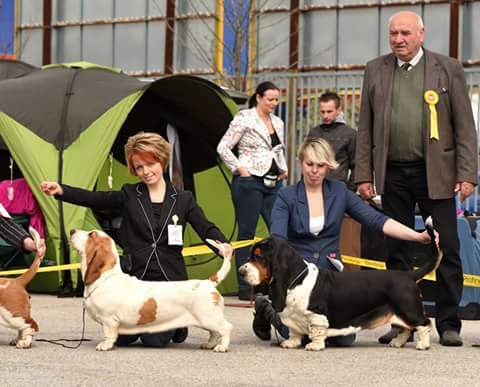 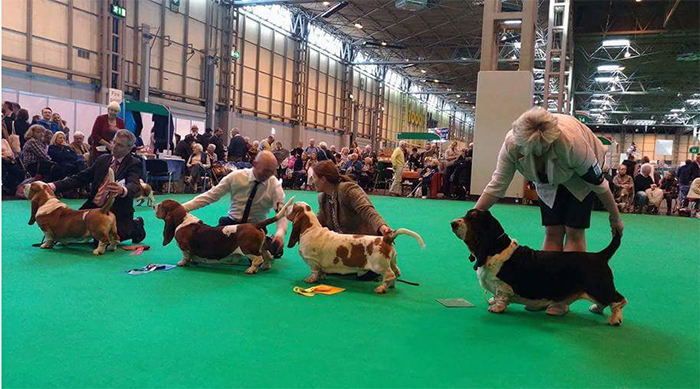 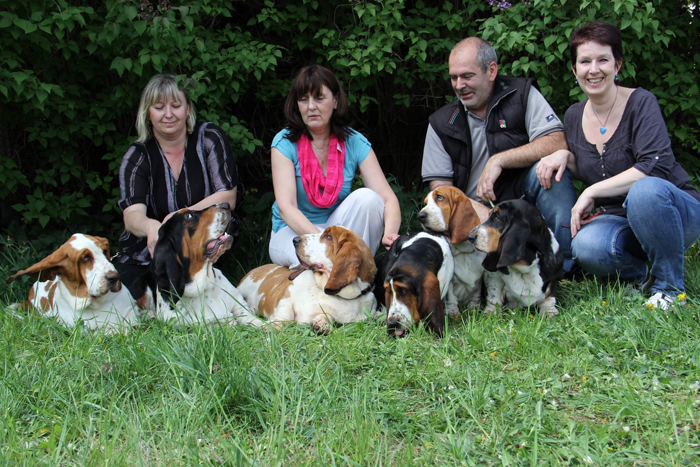 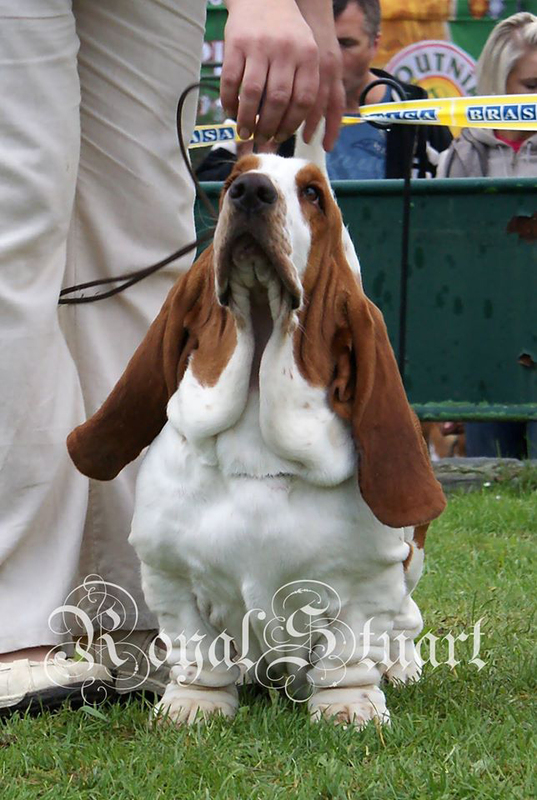 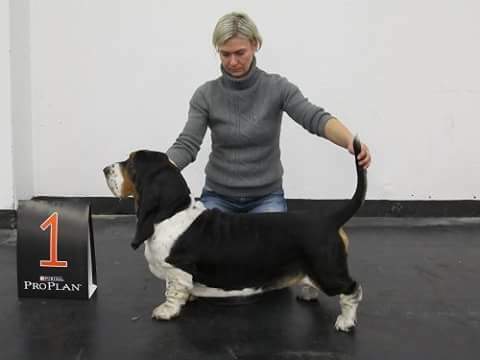 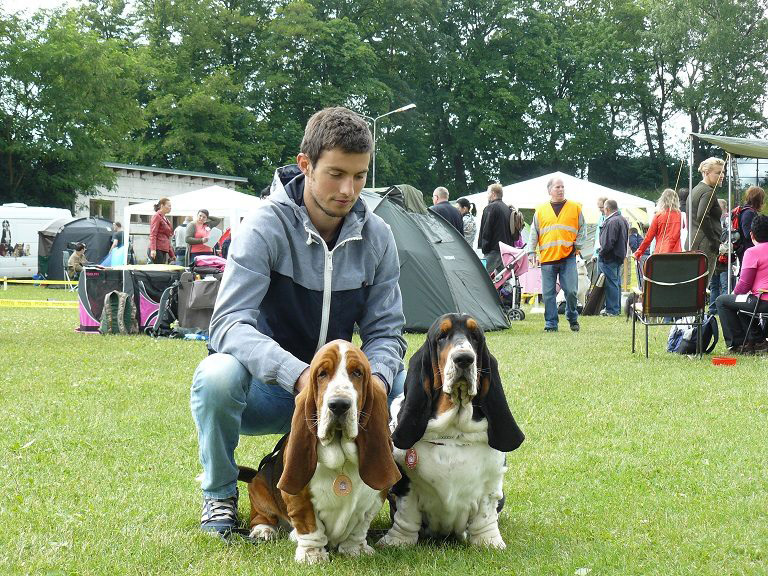 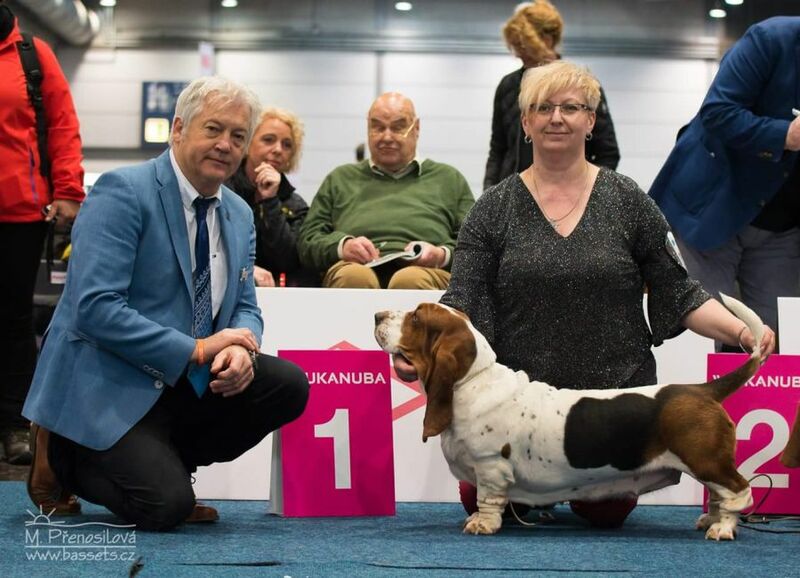 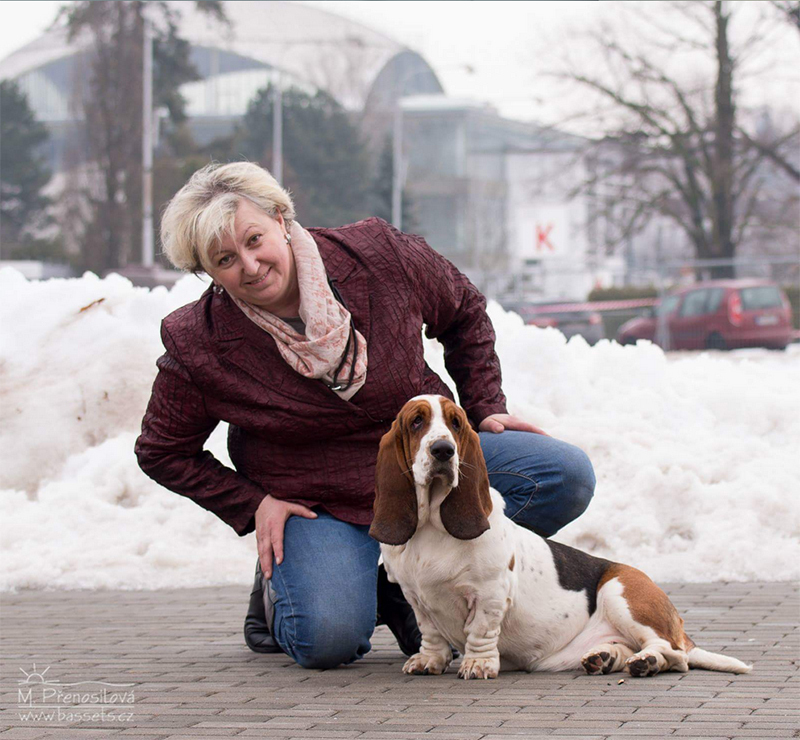 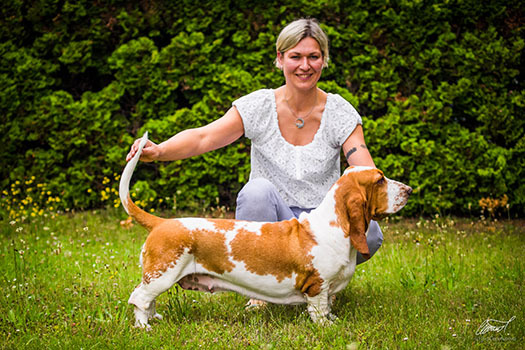 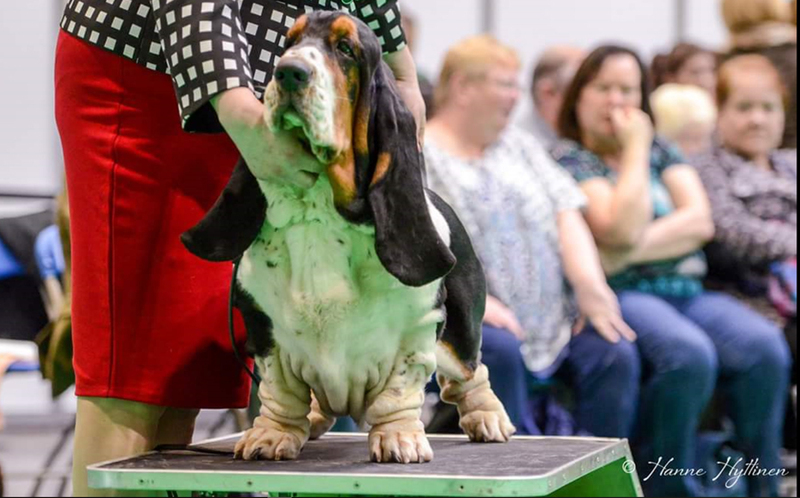 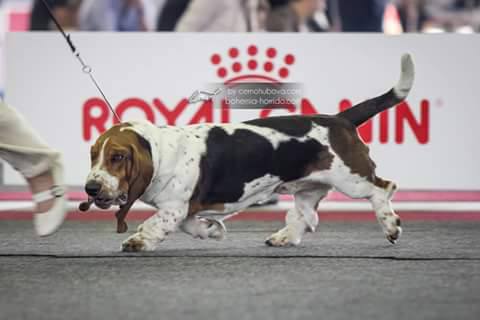 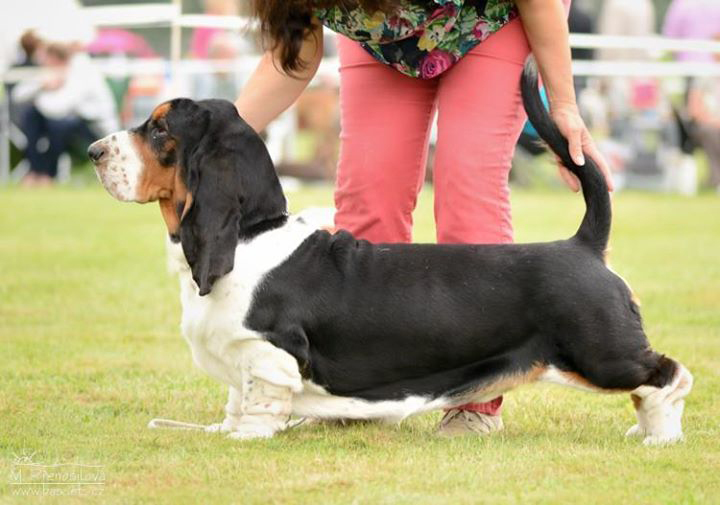 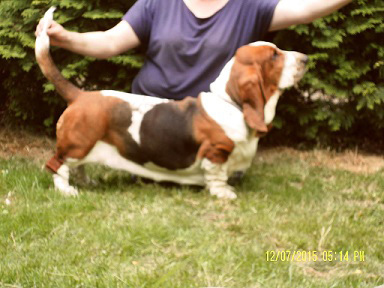 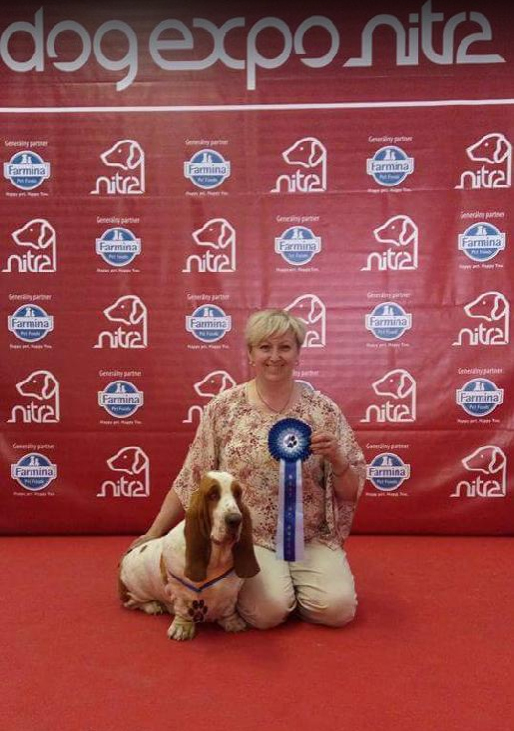 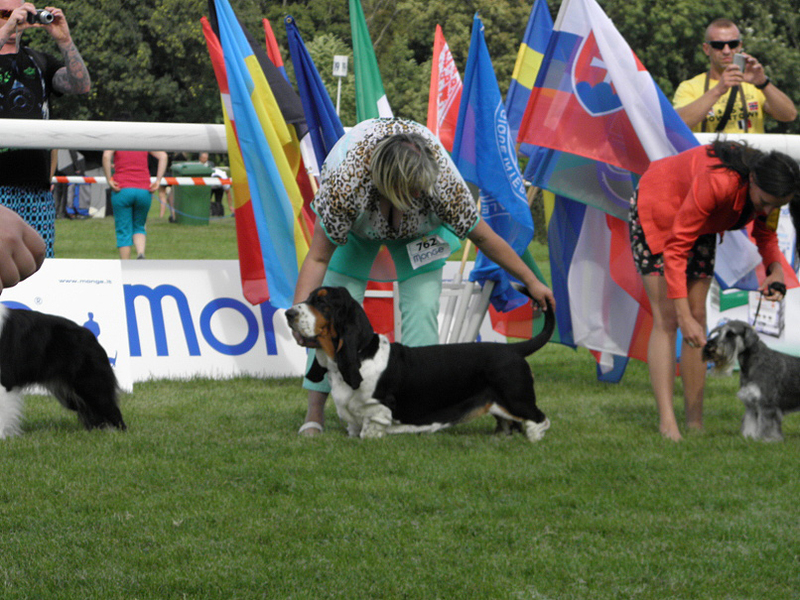 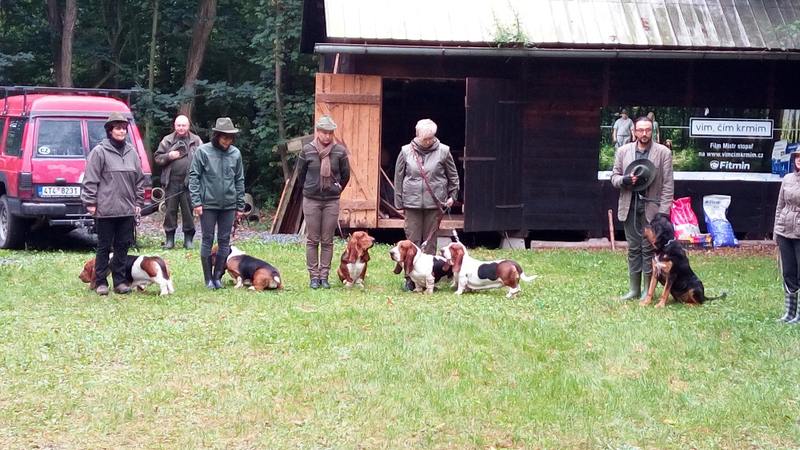 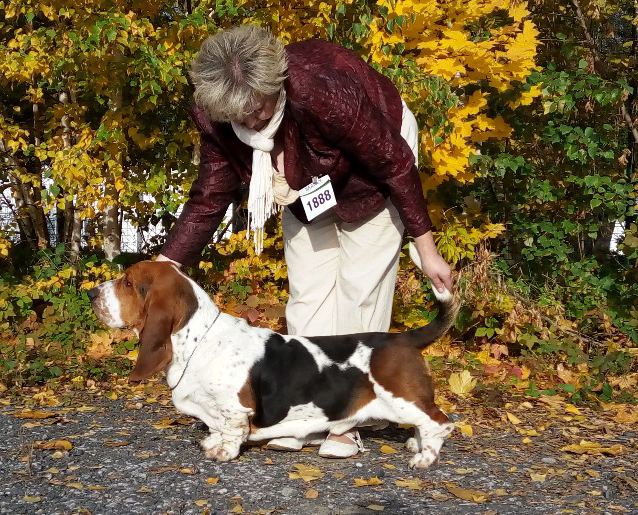 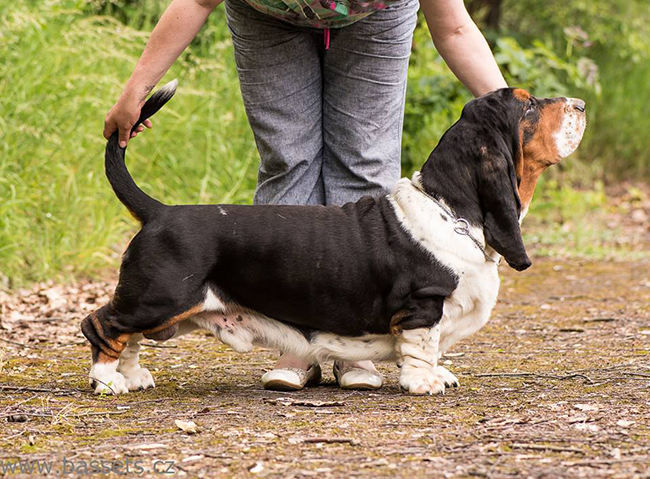 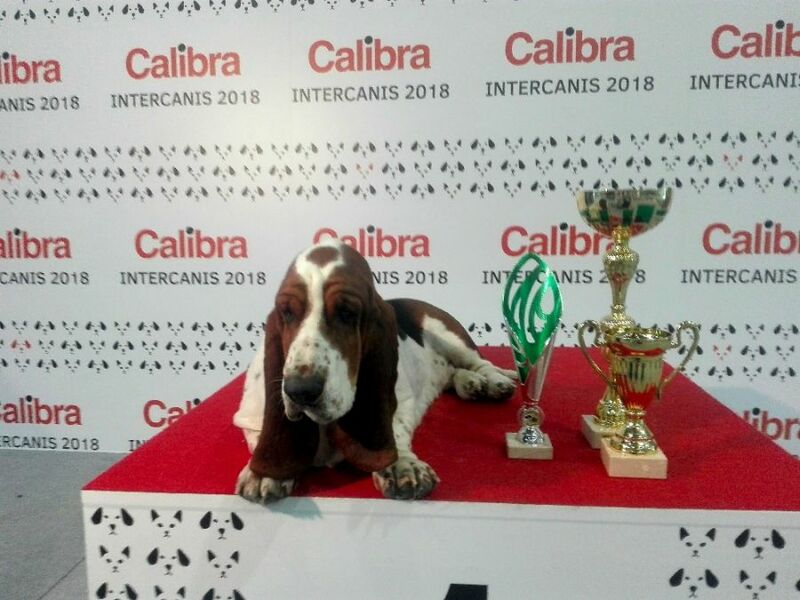 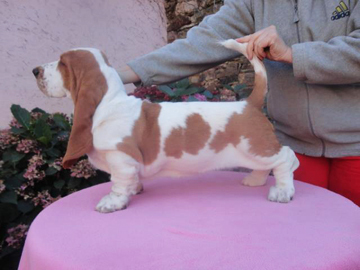 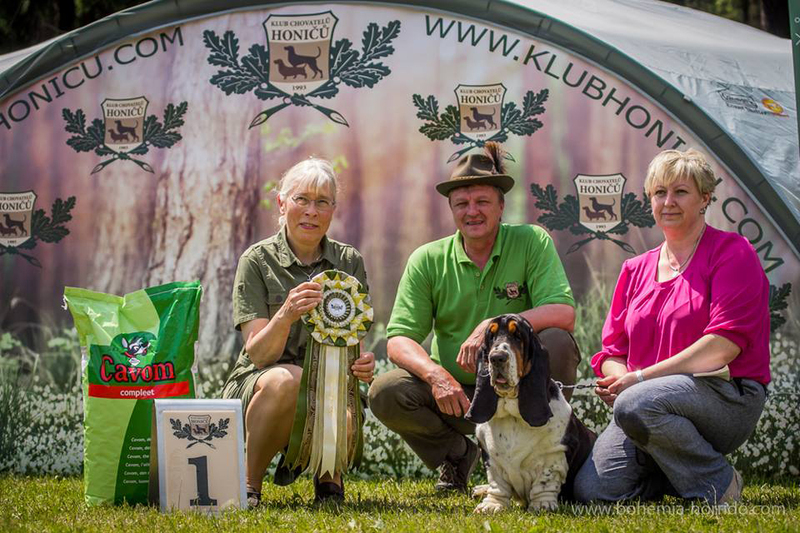 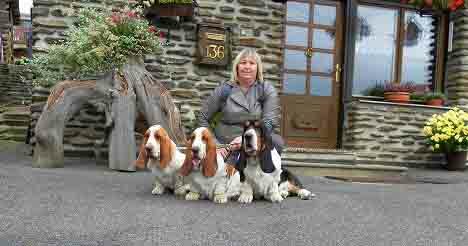 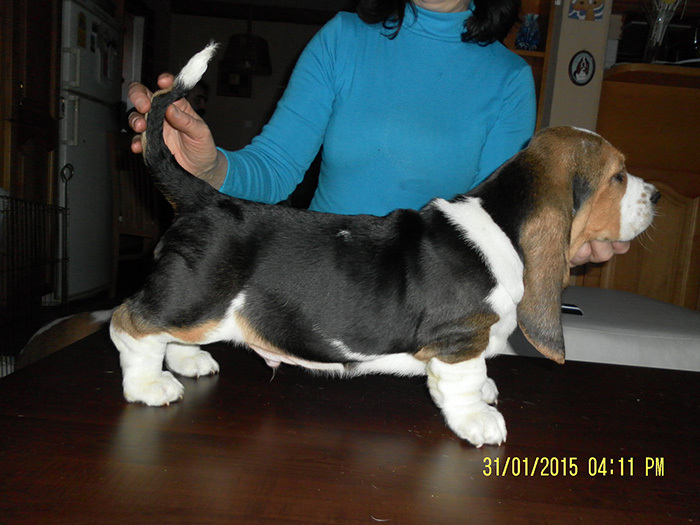 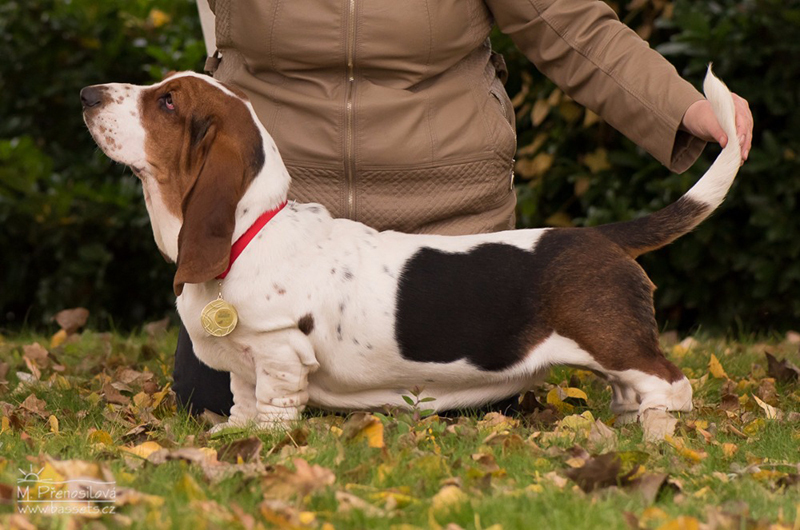 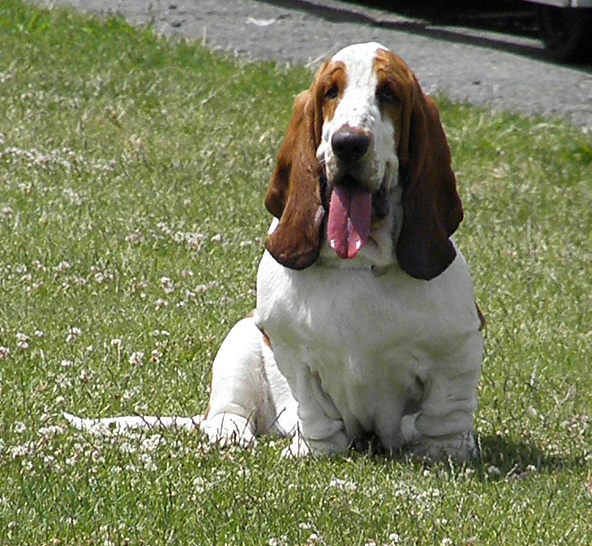 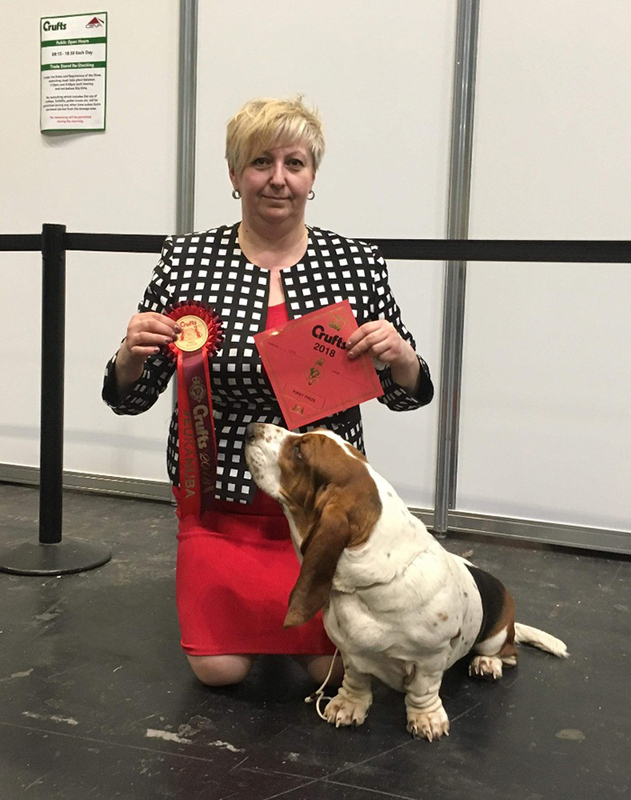 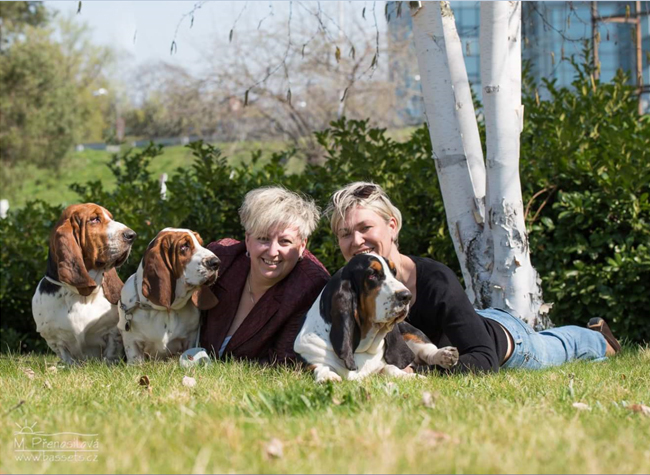 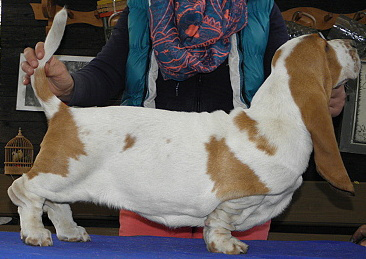 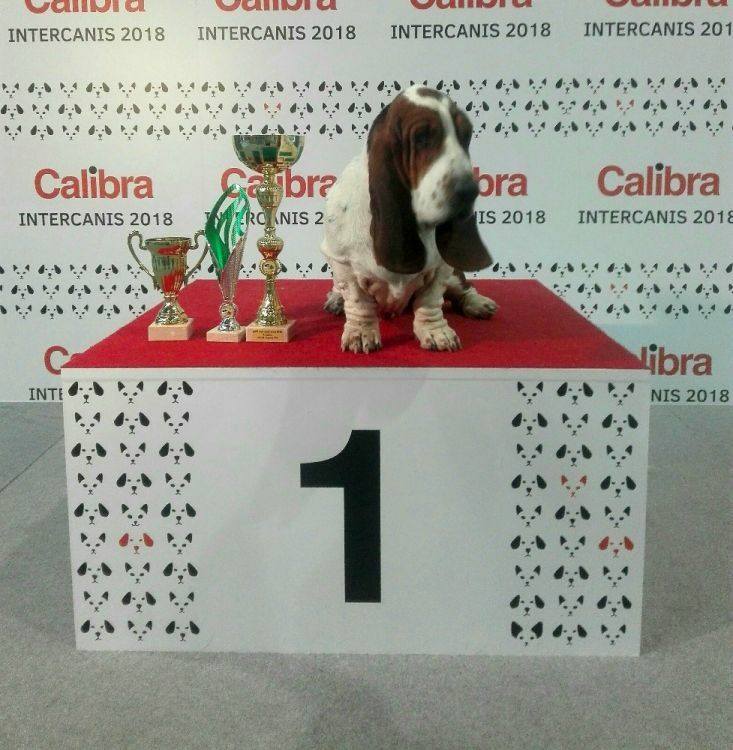 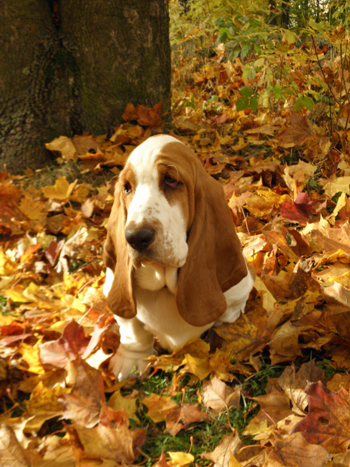 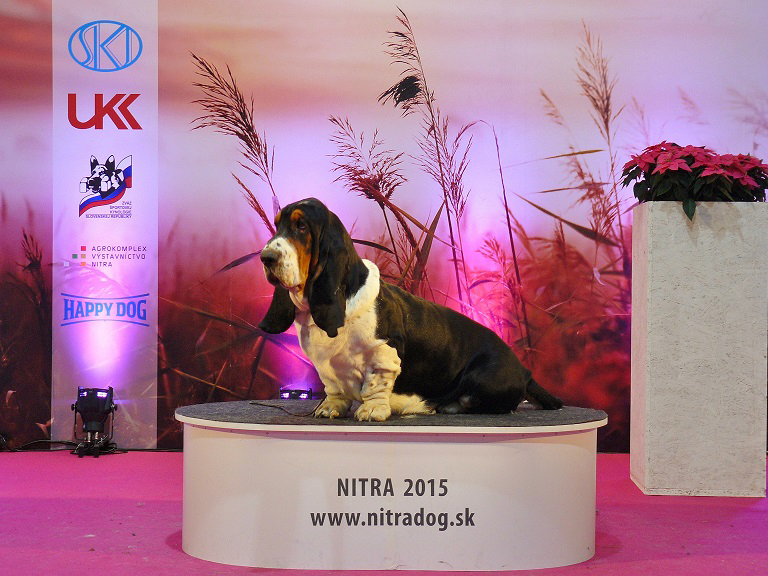 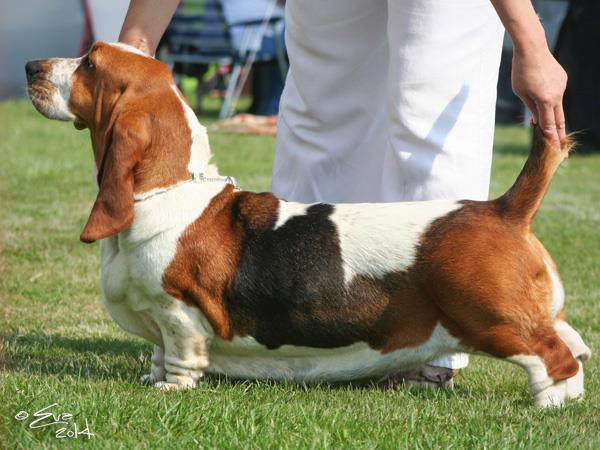 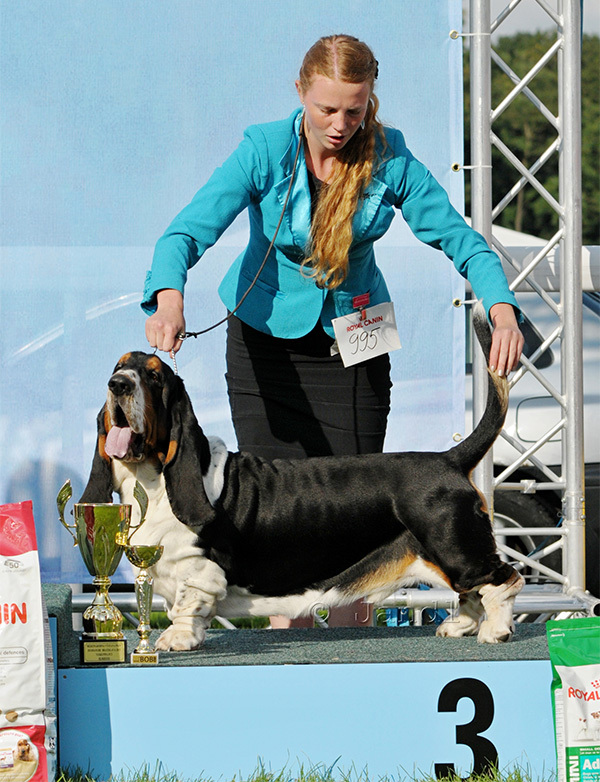 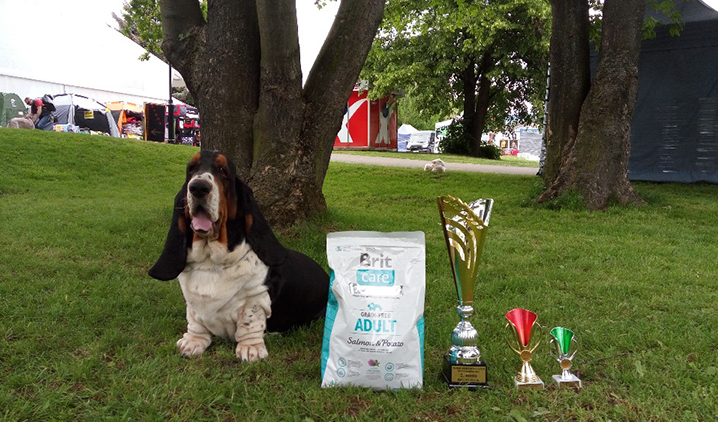 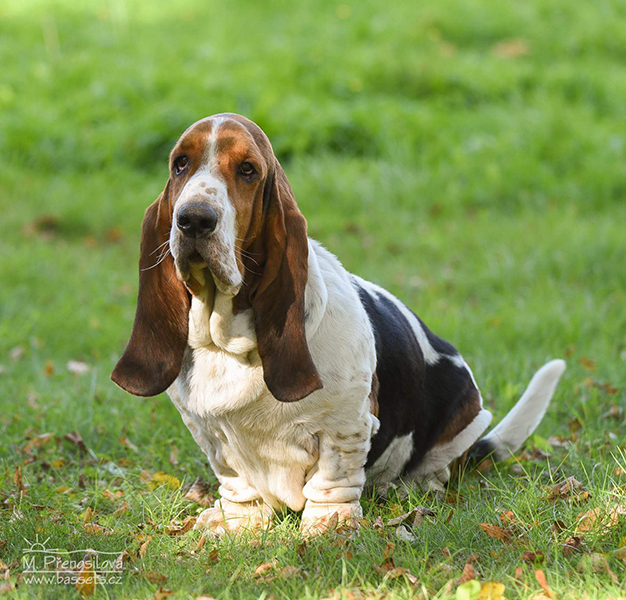 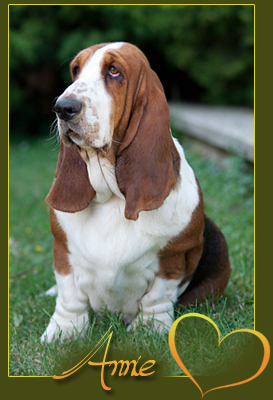 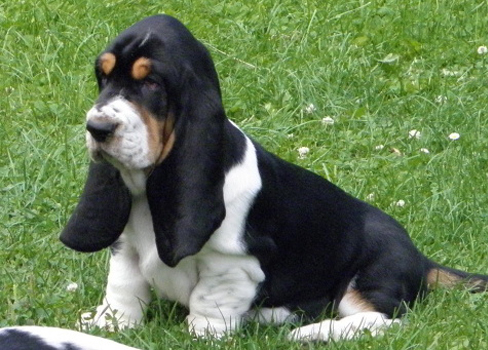 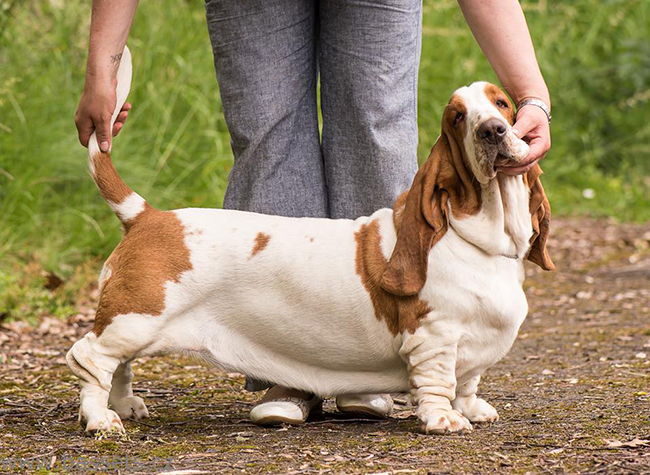 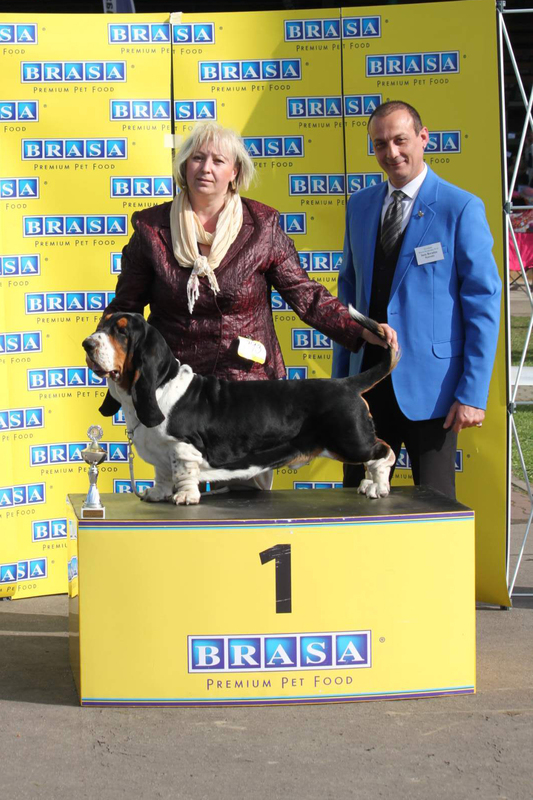 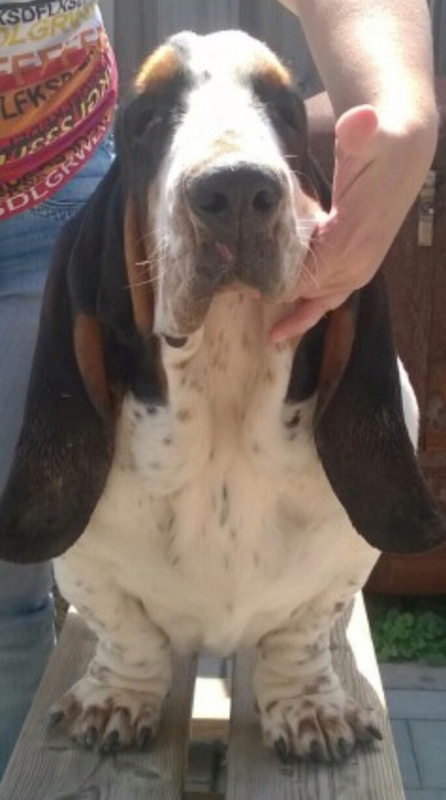 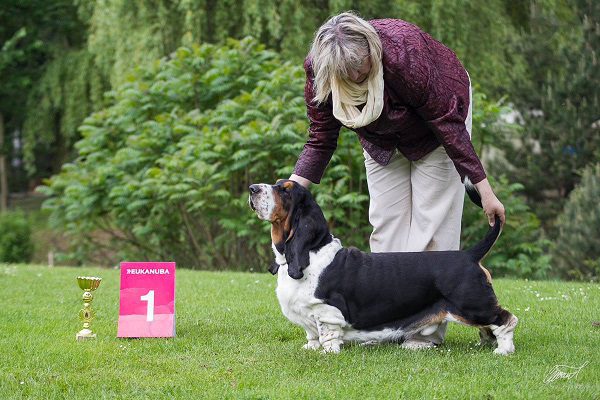 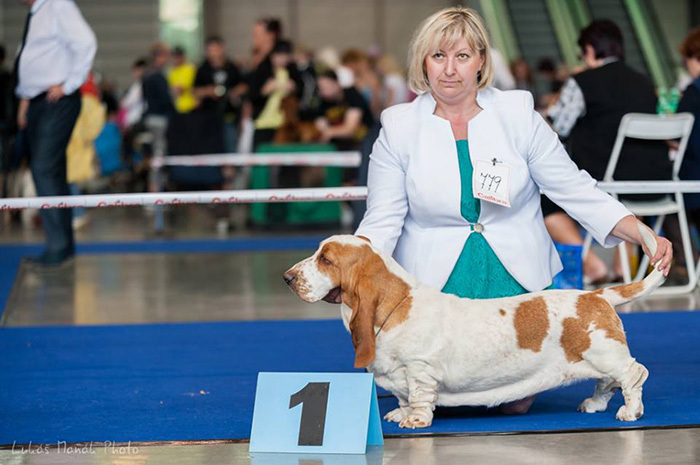 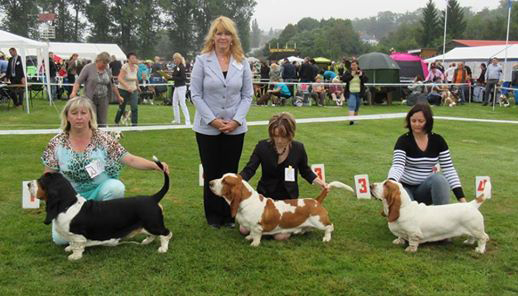 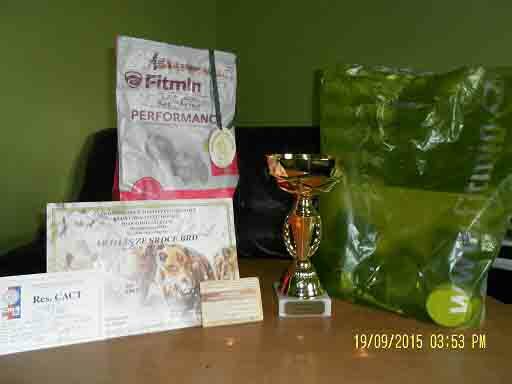 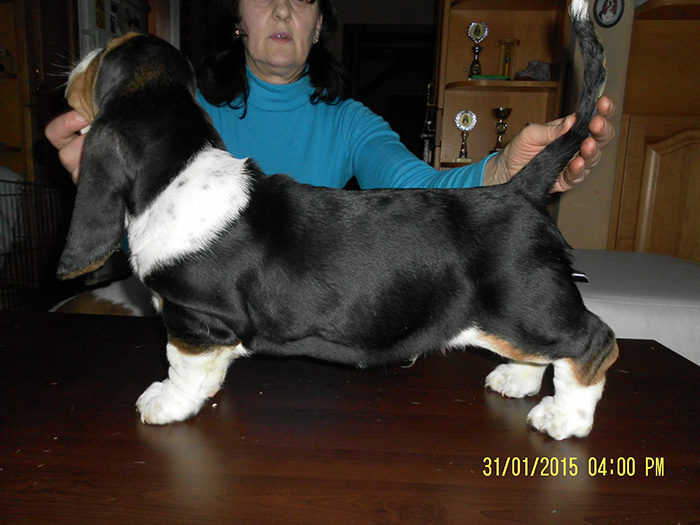 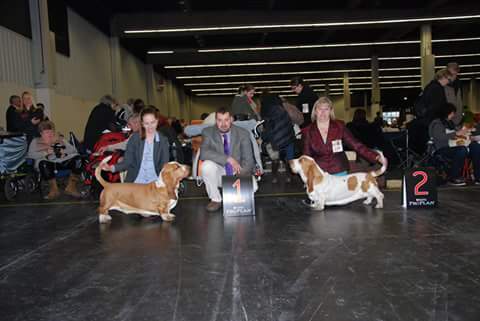 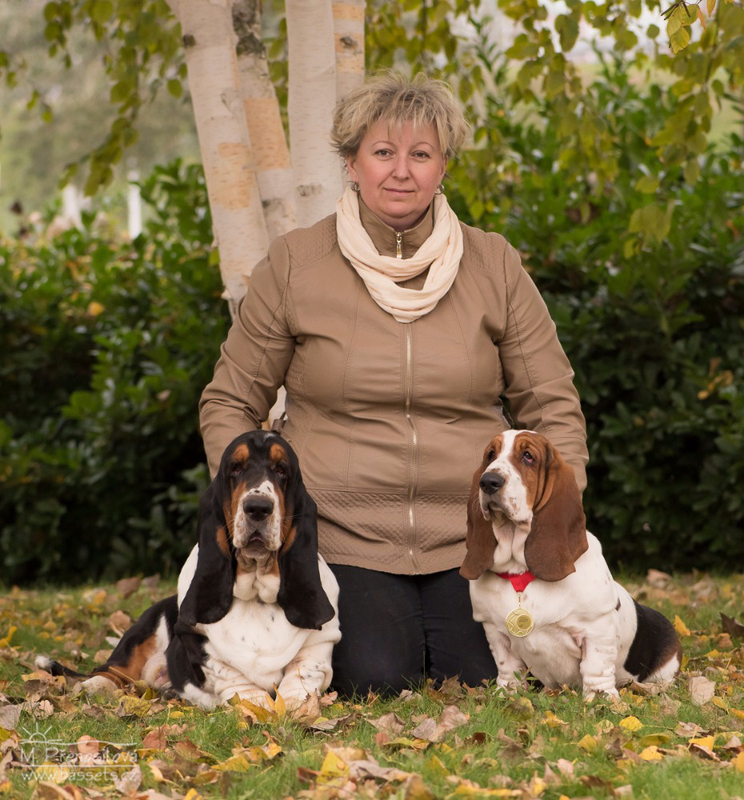 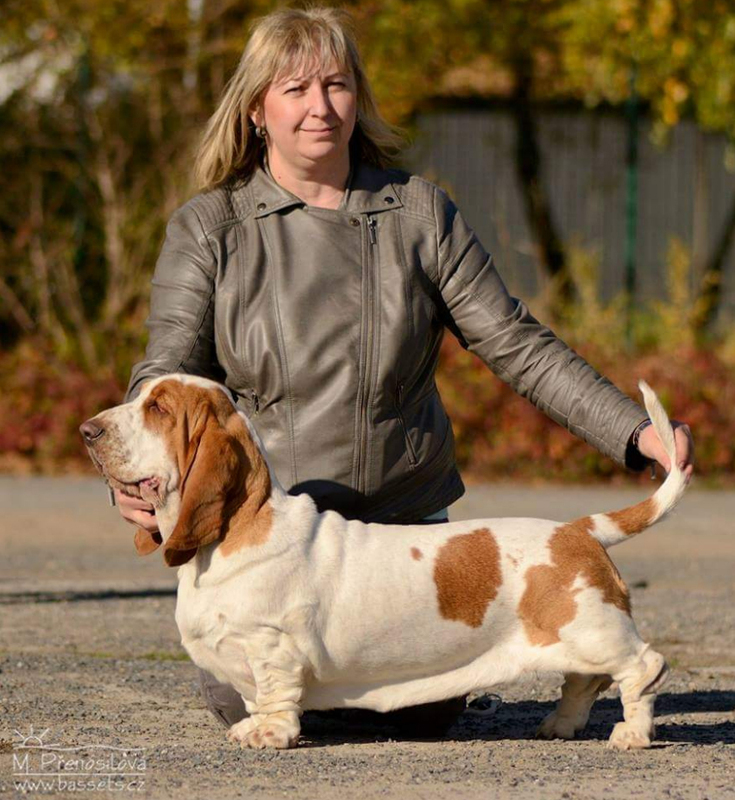 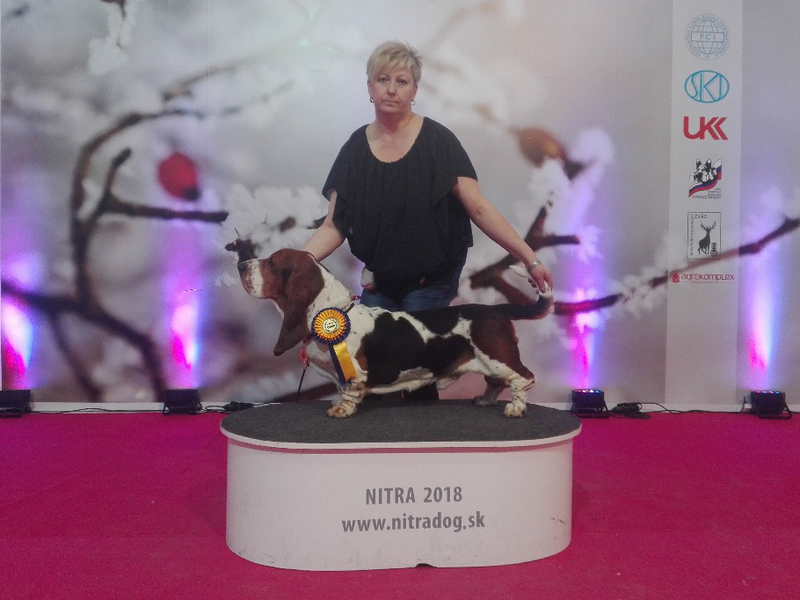 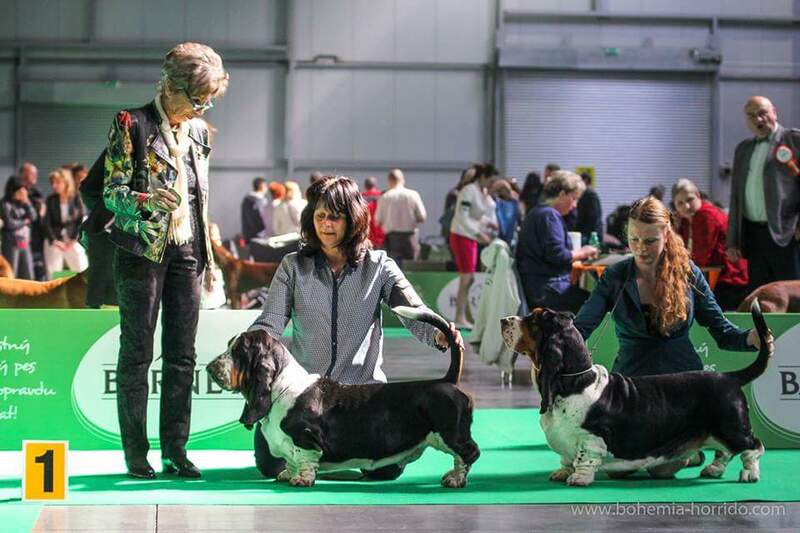 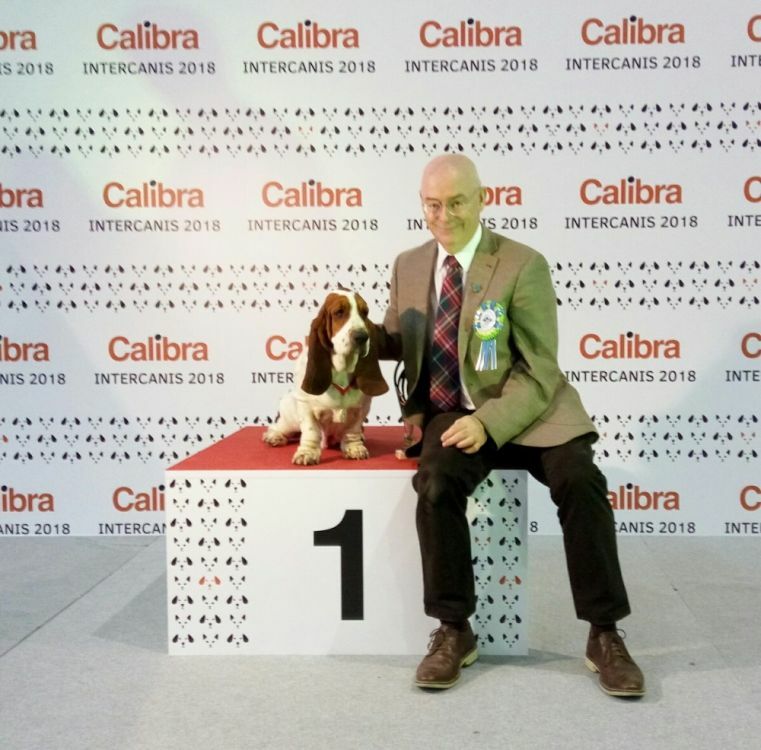 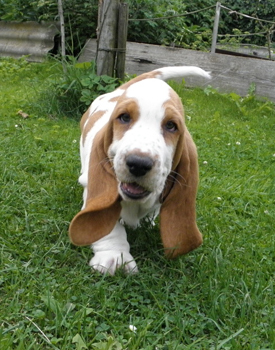 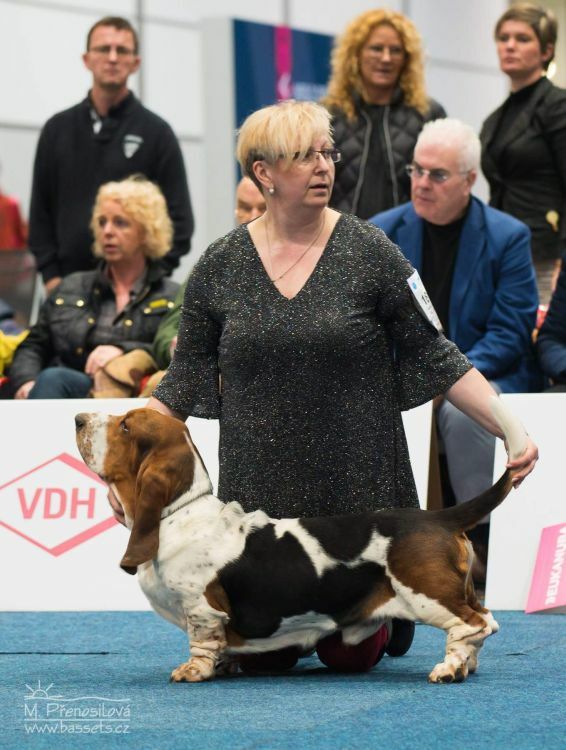 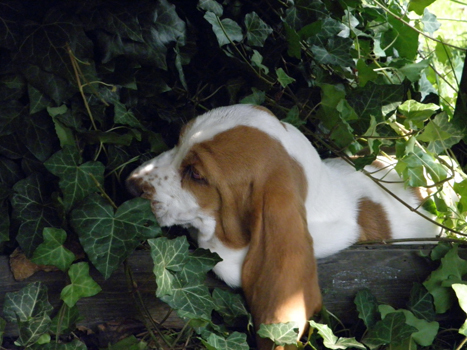 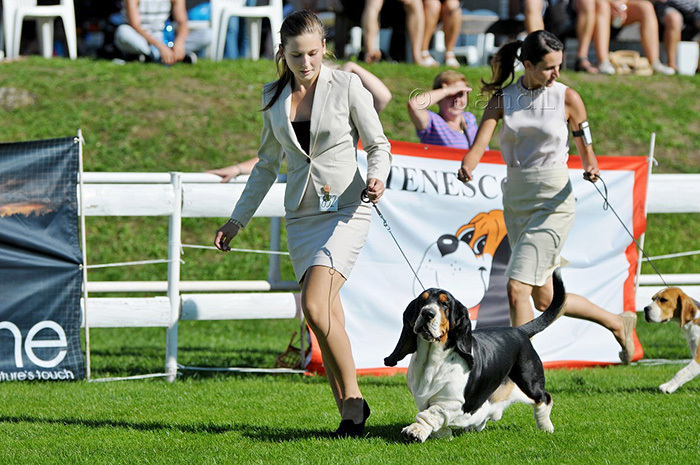 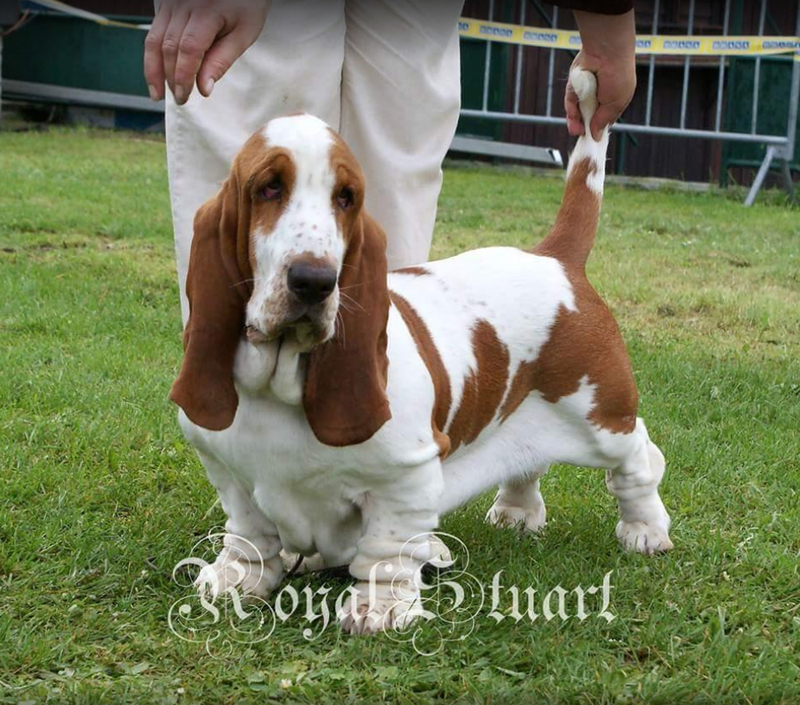 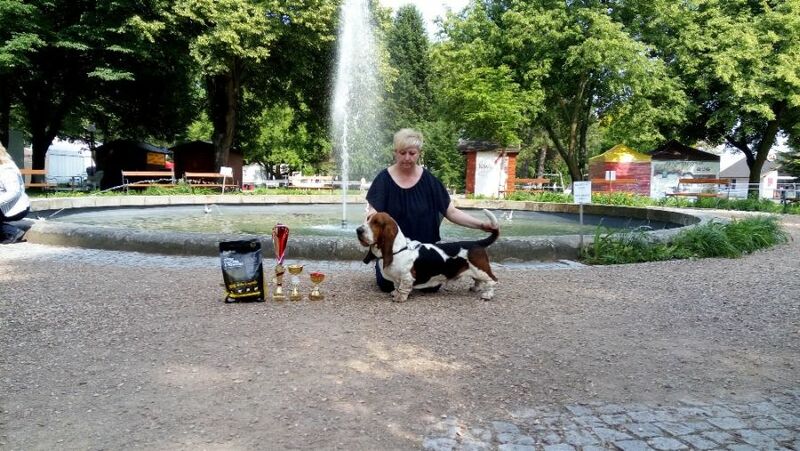 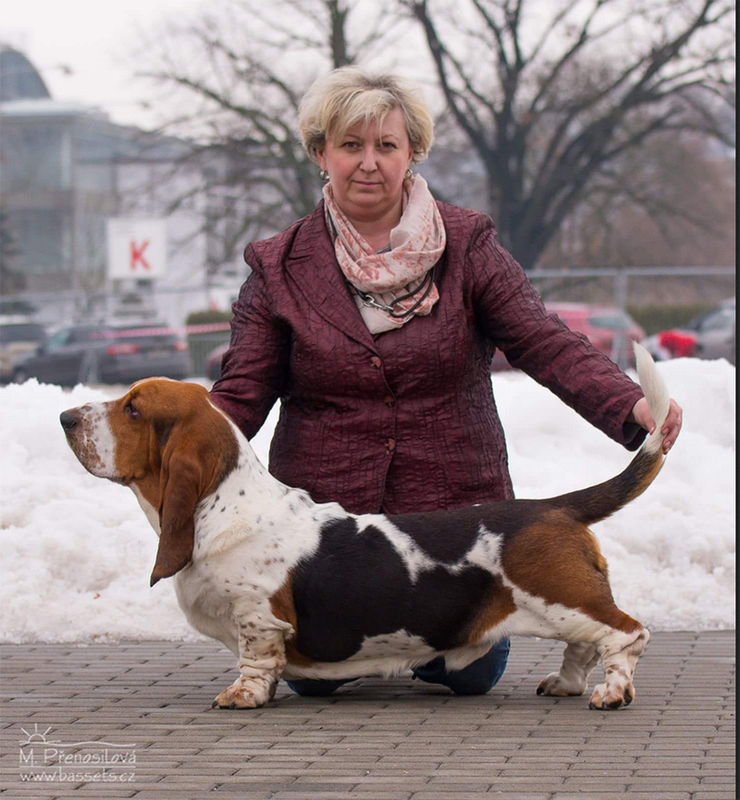 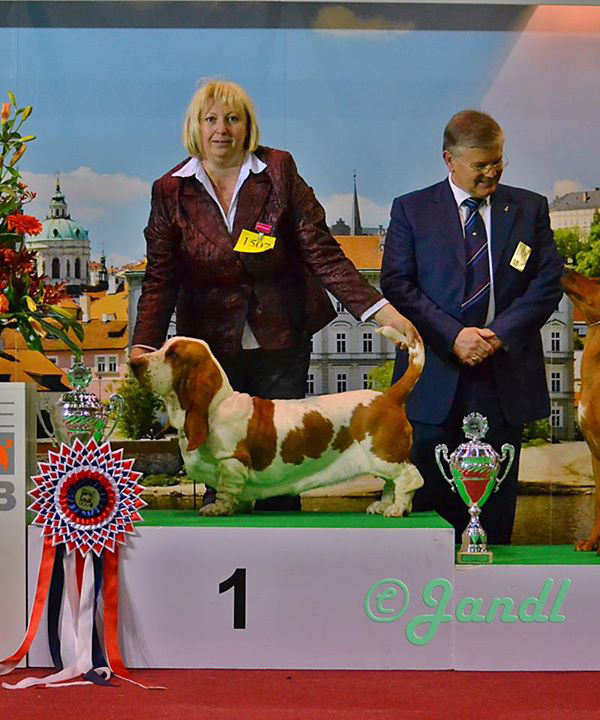 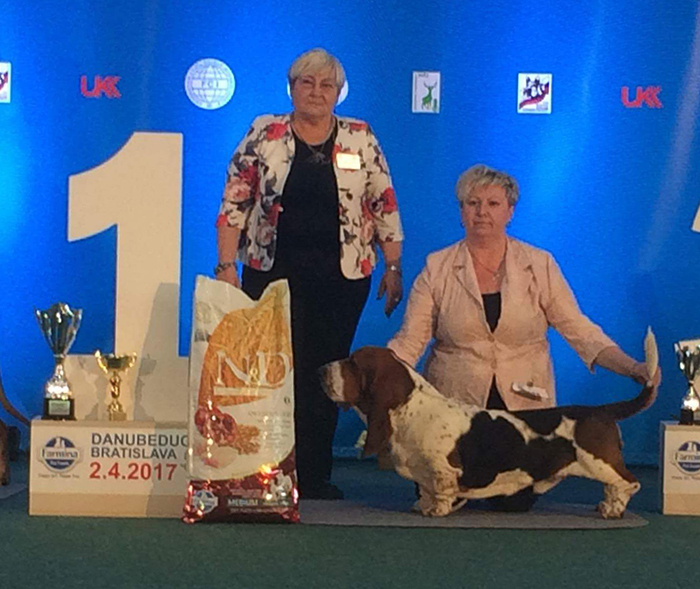 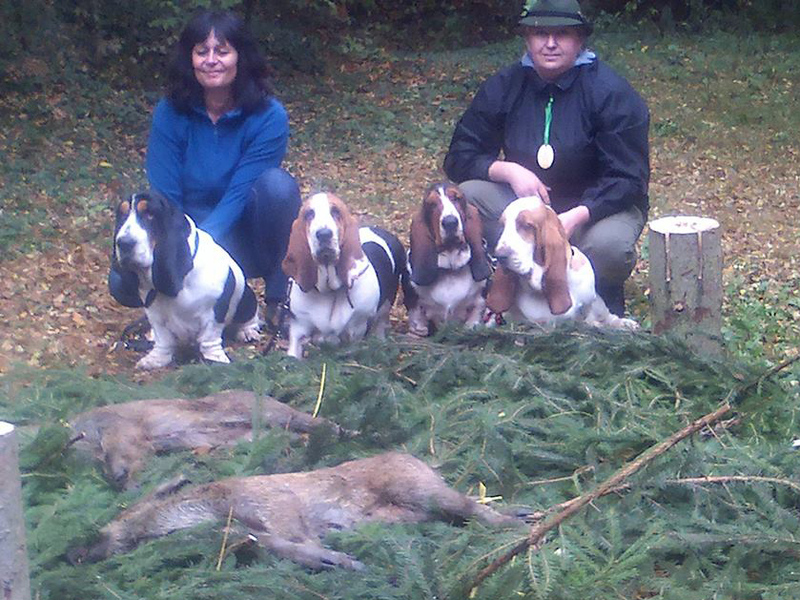 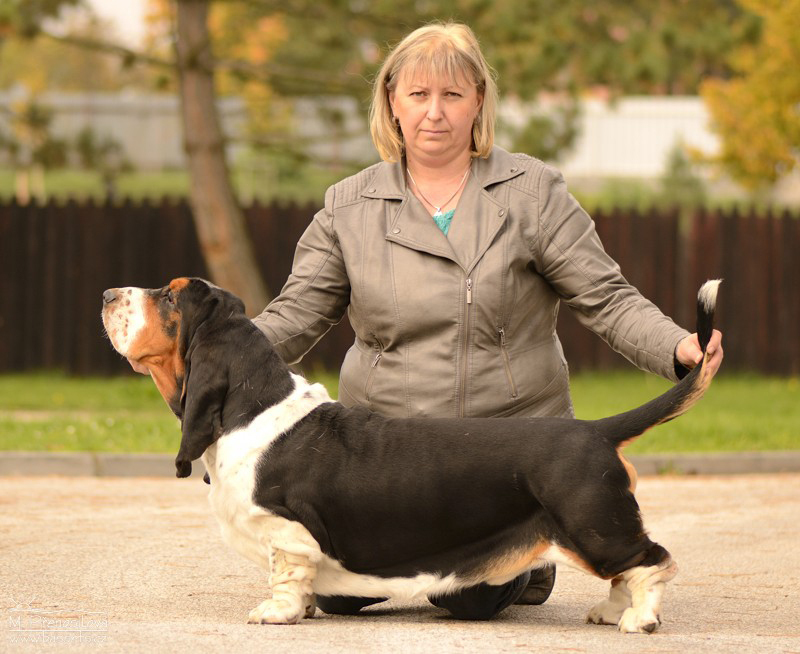 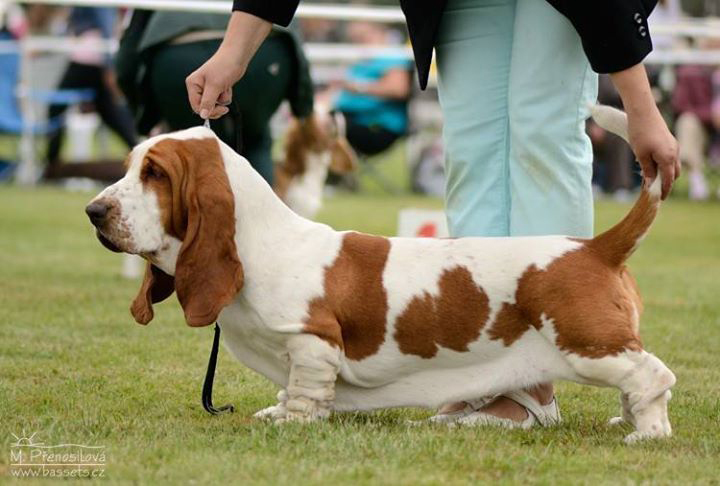 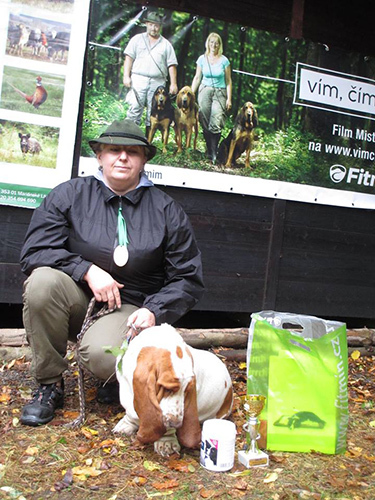 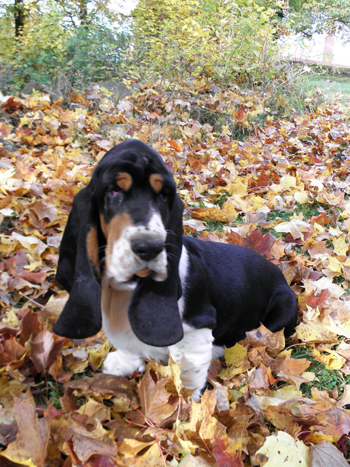 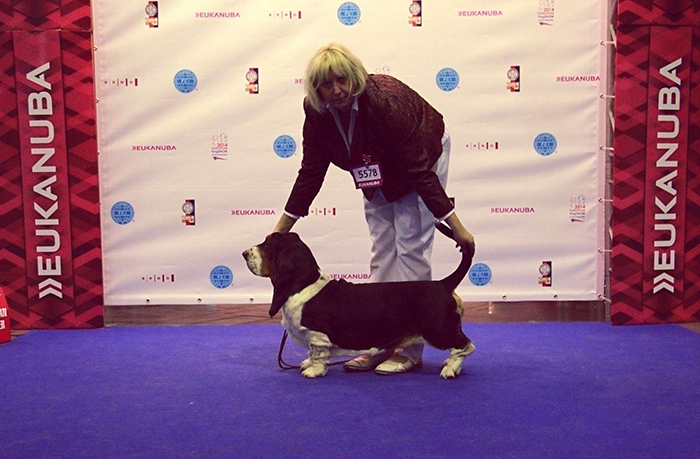 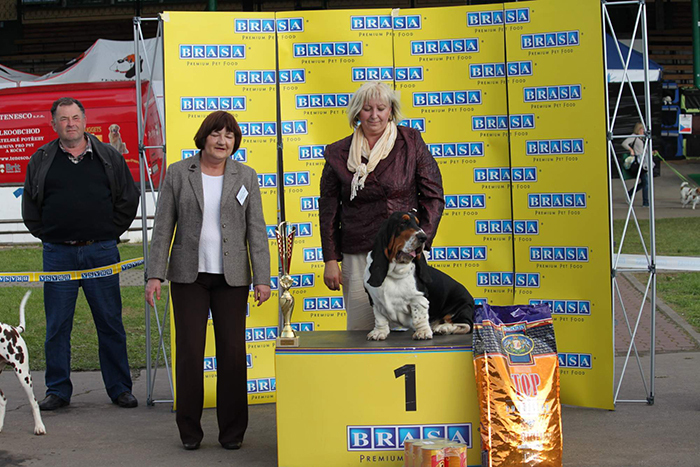 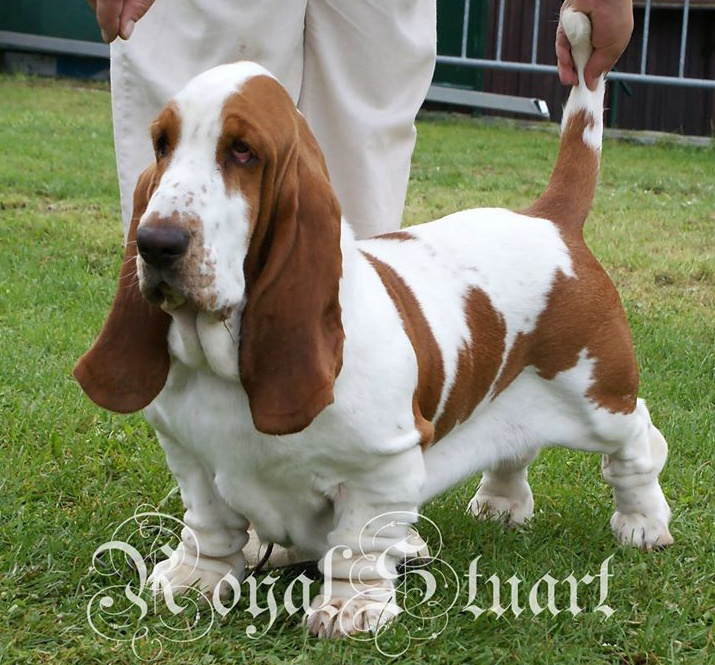 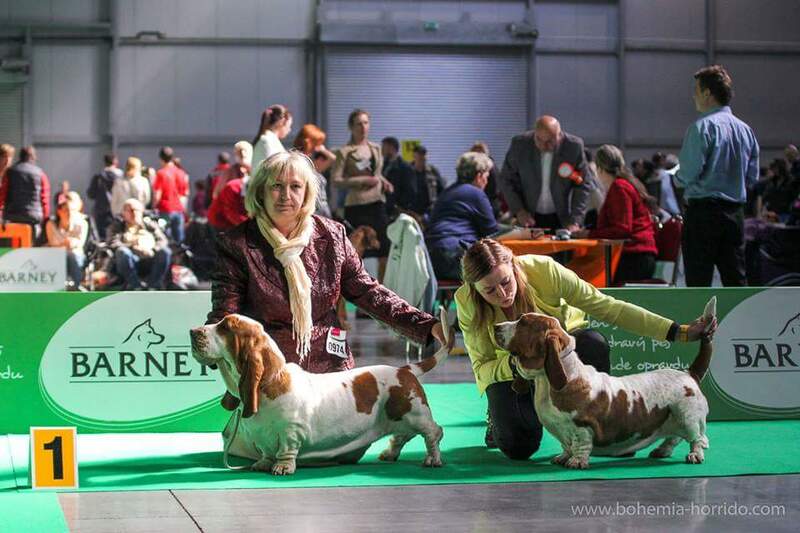 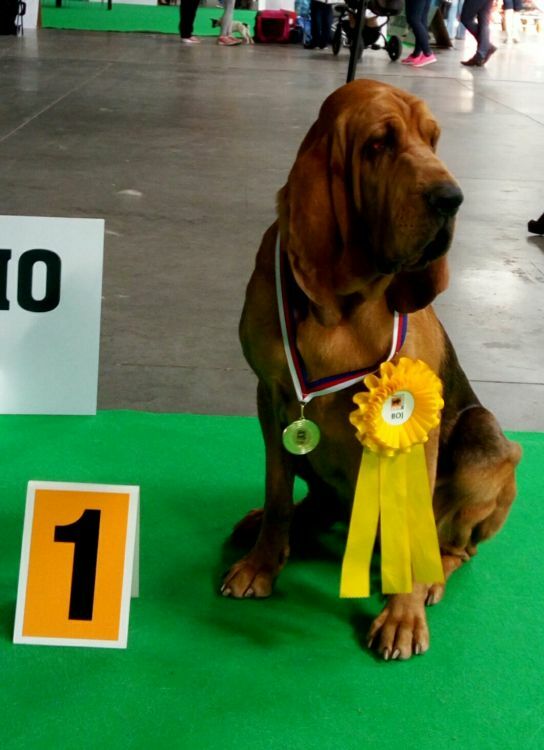 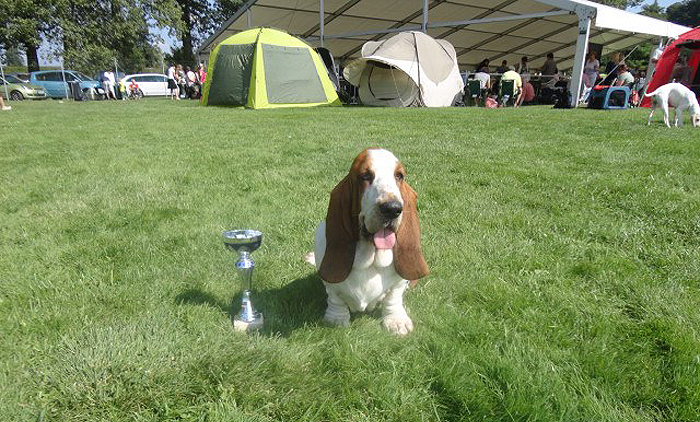 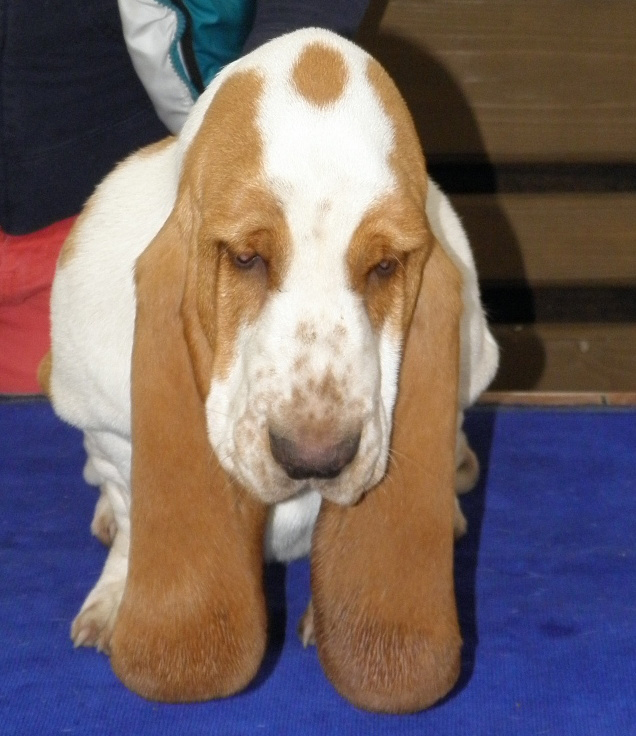 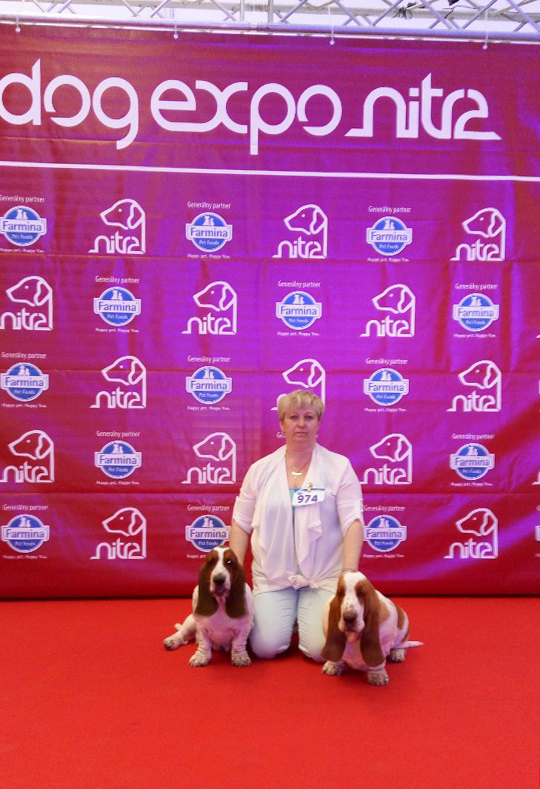 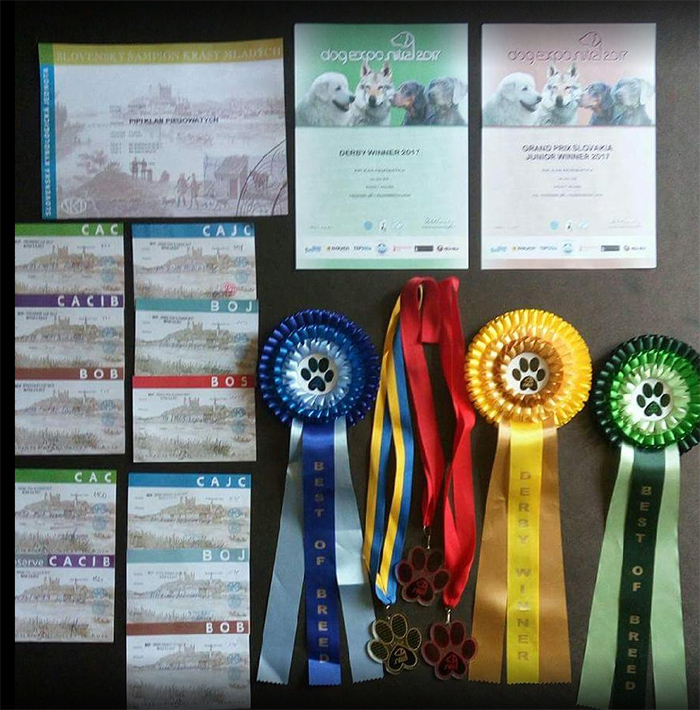 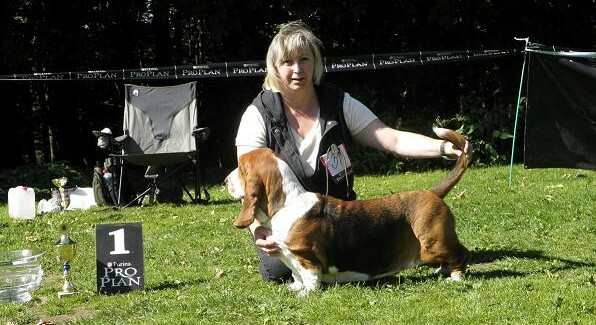 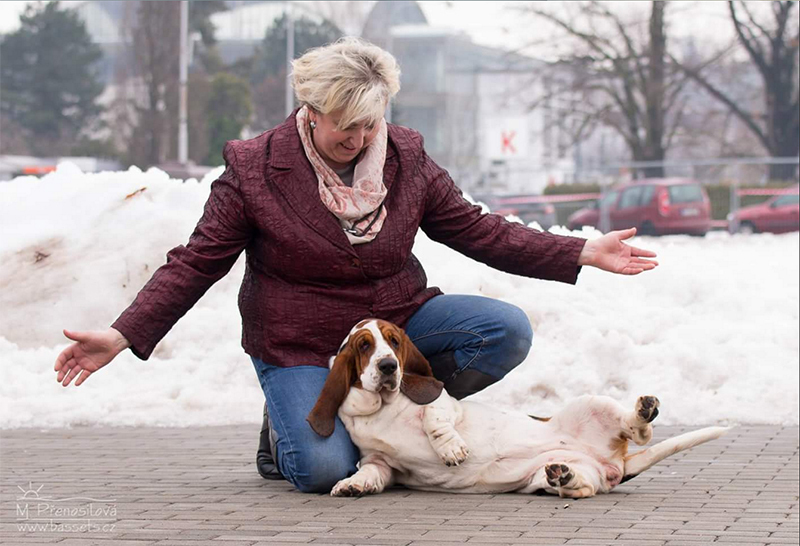 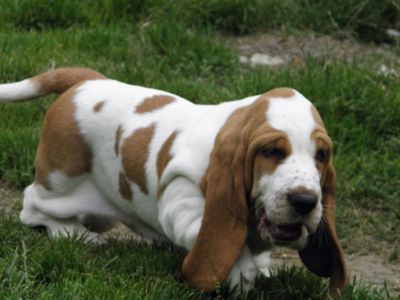 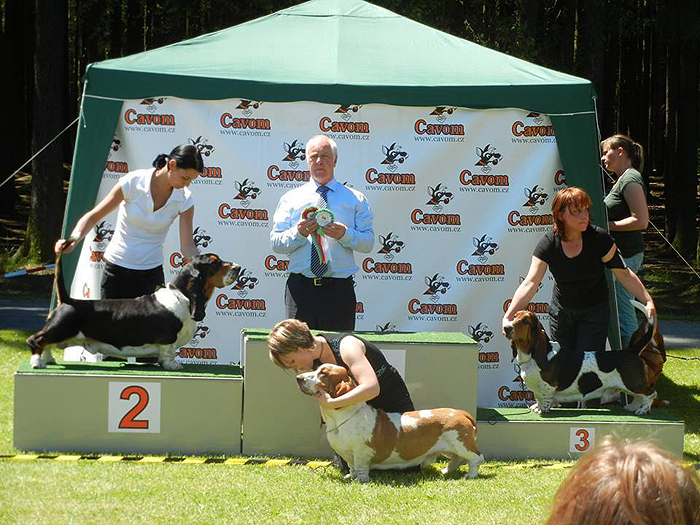 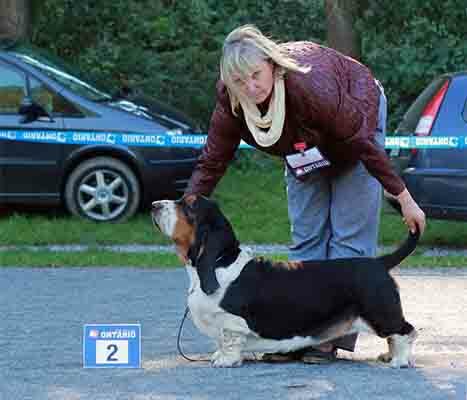 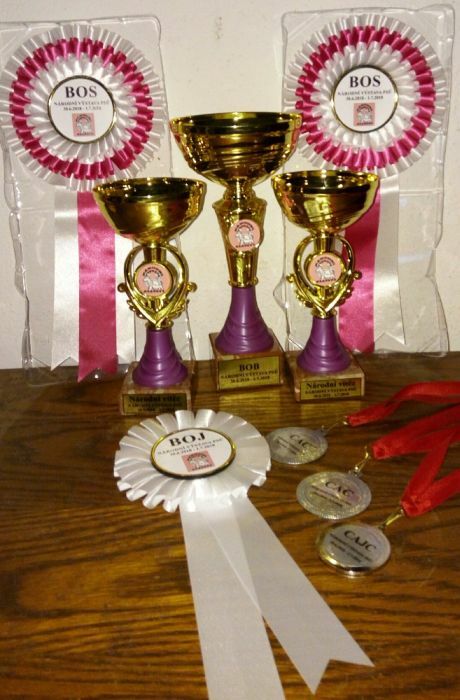 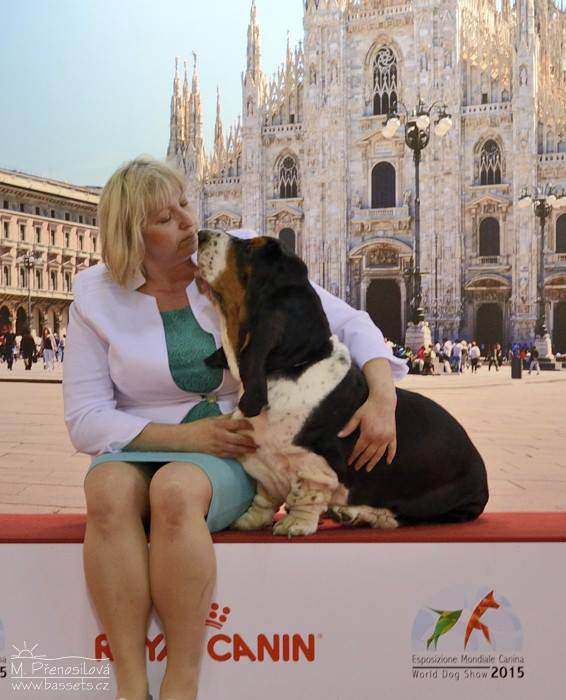 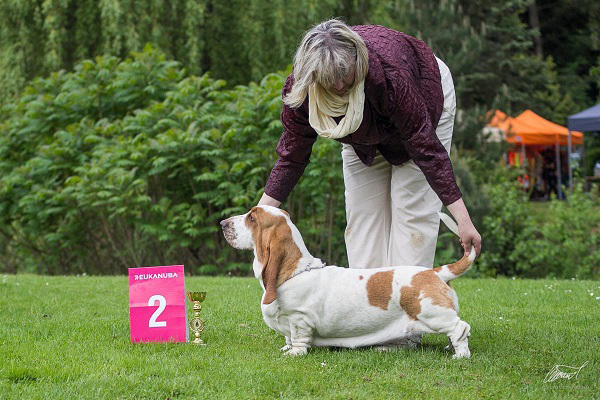 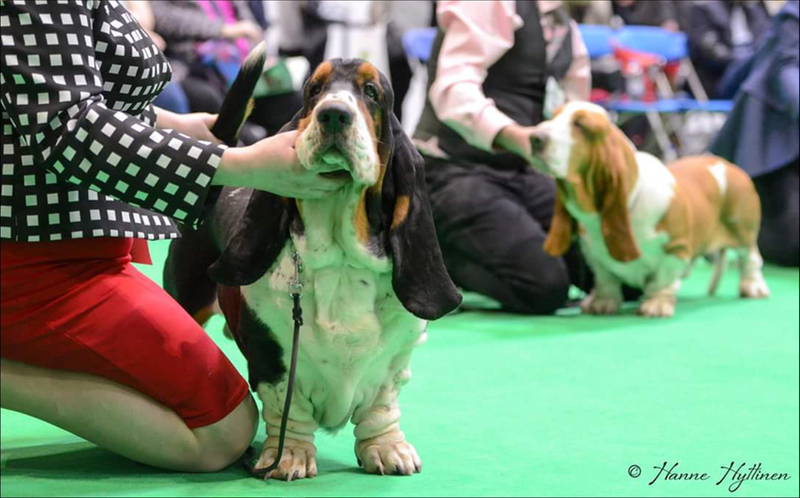 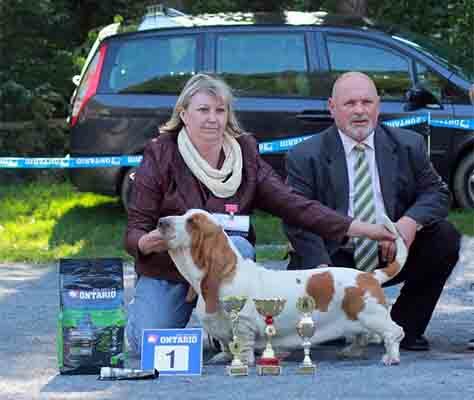 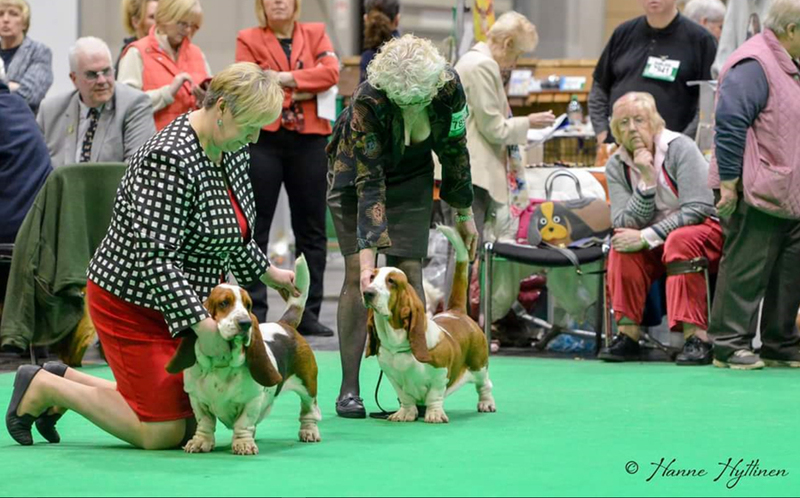 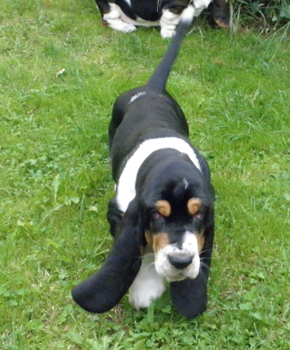 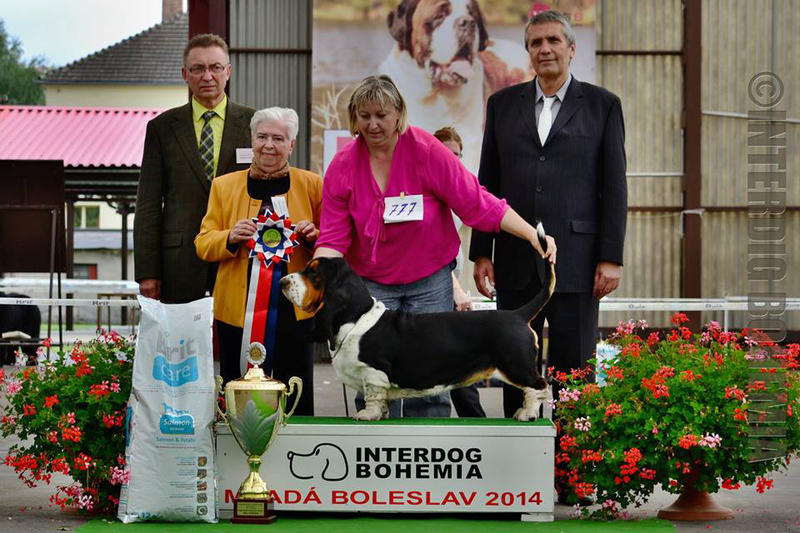 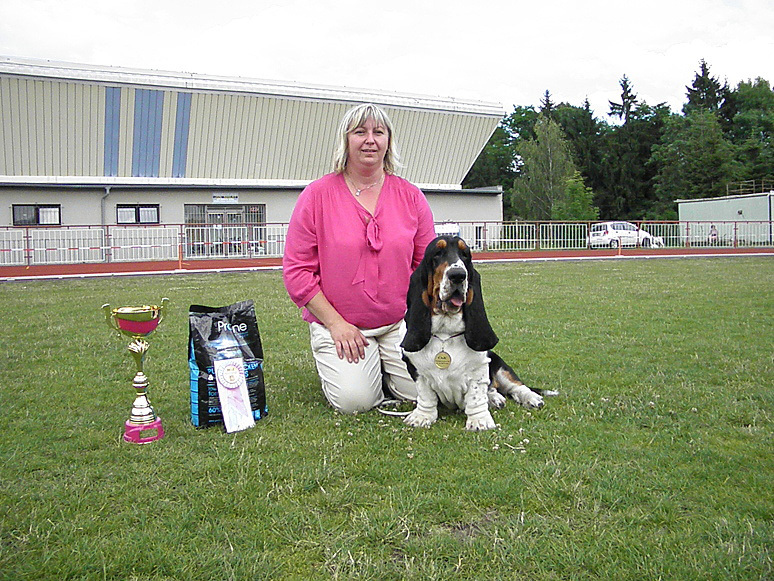 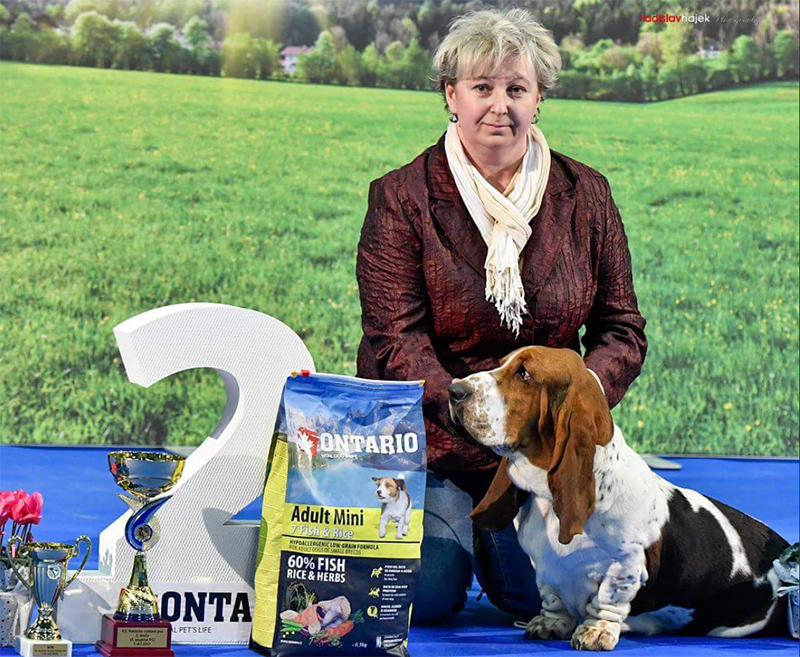 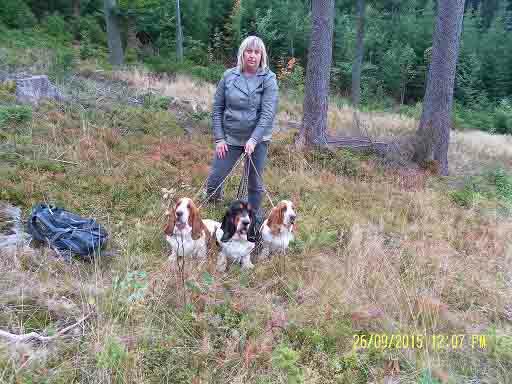 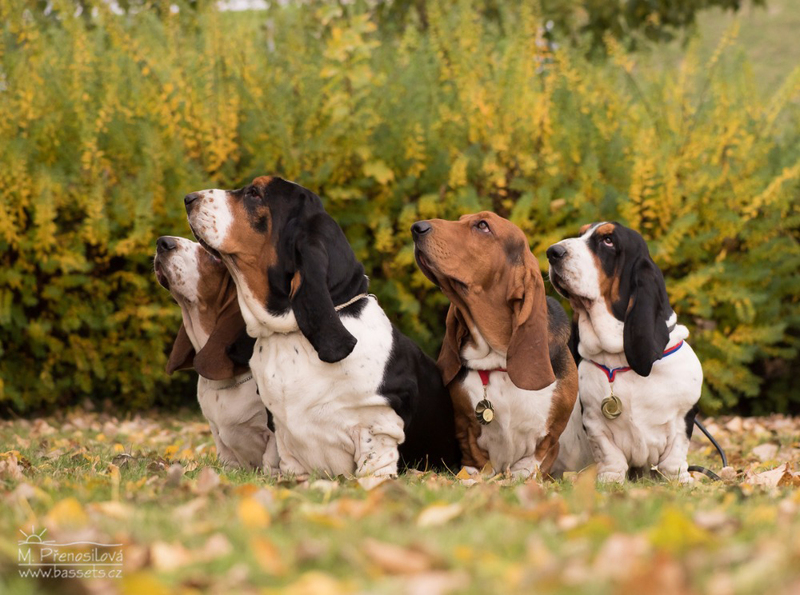 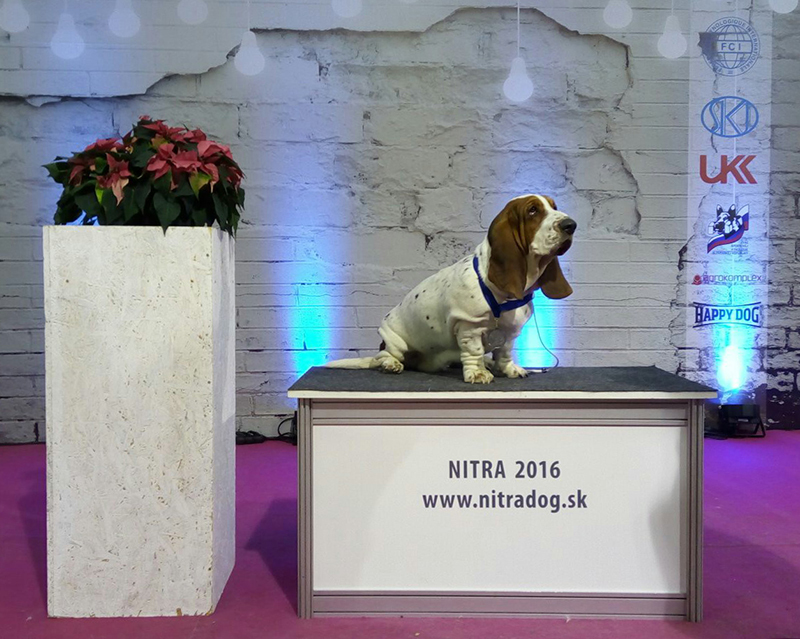 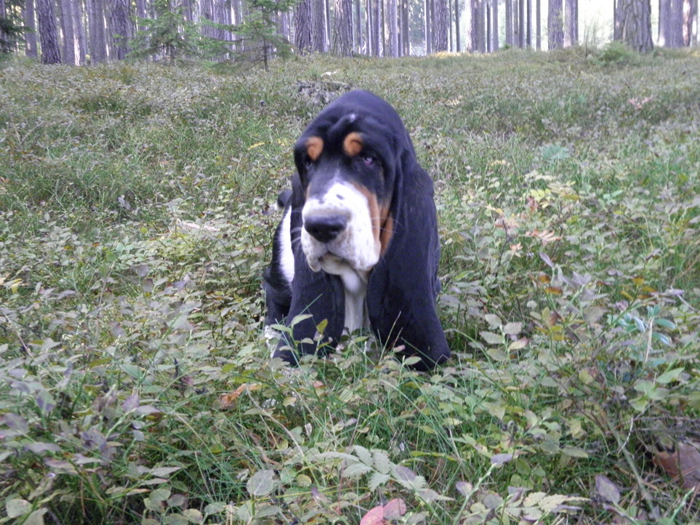 Our basset girl Annabell Annie van Hallen was recognized as Czech Junior champion.